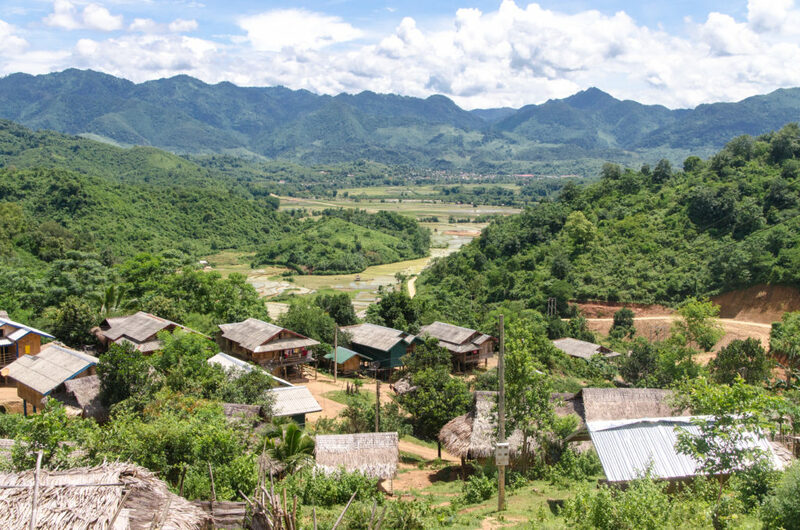 In our last blog, we detailed the lives of school-age children (age 6-16), who generally have regular chores (such as weaving or farm work) in modern village life in hill tribe Laos and Vietnam. Infants and little kids up to five-year-olds, however, appear to Maren and me to live in a most ideal world: one that is full of affection, attention, freedom, and play. 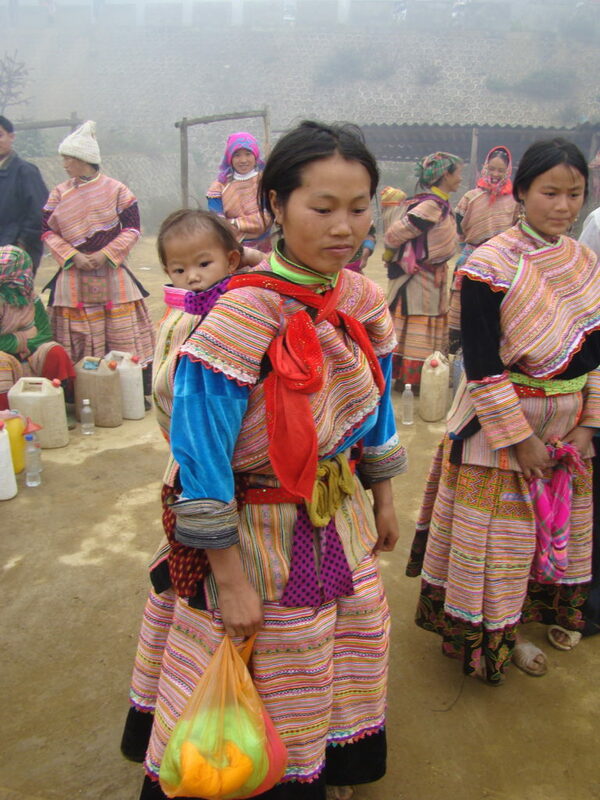 A Flower Hmong mother at the weekly village market in northern Vietnam. From day one, infants are held close to the mother’s (or another person’s) body at virtually all hours of the day. Working mothers, whether in the field, at the loom, or cooking over the hearth’s fire, often have an infant strapped on their back. If mom isn’t available (or is finally able to catch a quick nap), there’s grandma, or a big brother, sister or aunt, or neighbor, available to assure the youngster is safe and close. In that regard, it is rare to hear infants cry for more than a second or two, if at all, and they seem to live by the tenet: You can’t over-spoil an infant. In many homes, grandmothers especially play a central role assisting with infants and raising young children. Blue Hmong woman shows off her beautiful son and her hand-dyed and embroidered baby carrier (with acrylic factory-made edging). The regional textiles mirror this focused responsibility and nurturance, and every ethnic group has unique designs and motifs for infant-wear. 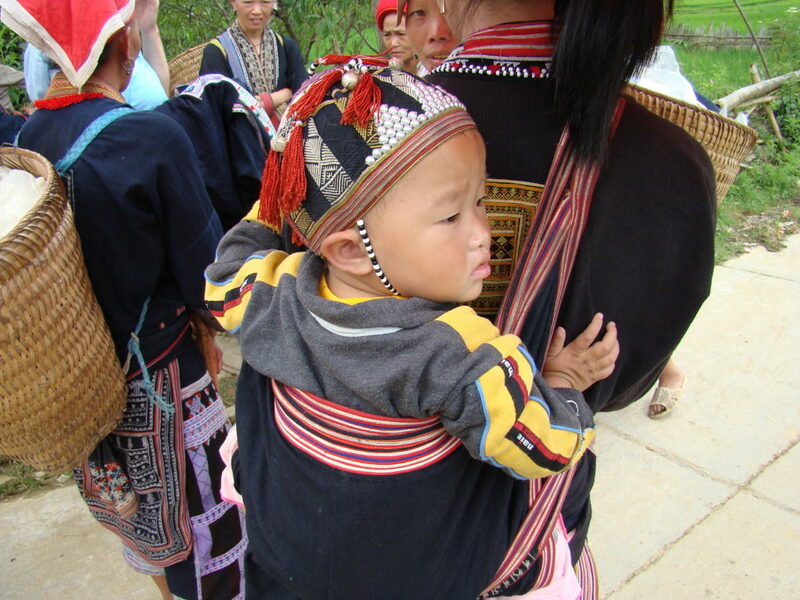 The Red Dzao of northern Vietnam have a special hat designed by the ancestors to protects infants from nefarious spirits. These red and black hats are covered in radiant designs of white seed-beads, cowry shells, small coins, and/or fluffy tassles – all symbols of good luck and protection. Tradition holds that a spirit looking down from above would only see this red and black flower design (and not the child under the hat), and thus move on, leaving the child unharmed. 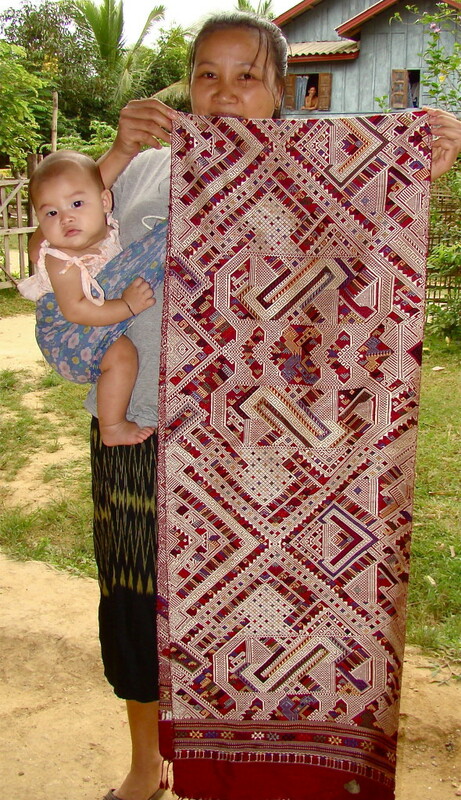 The Tai Daeng people of NE Laos have a special children’s blanket called a phaa tuum, and its motifs often reveal the phii nyak, a vicious traditional spirit known to protect the innocent. 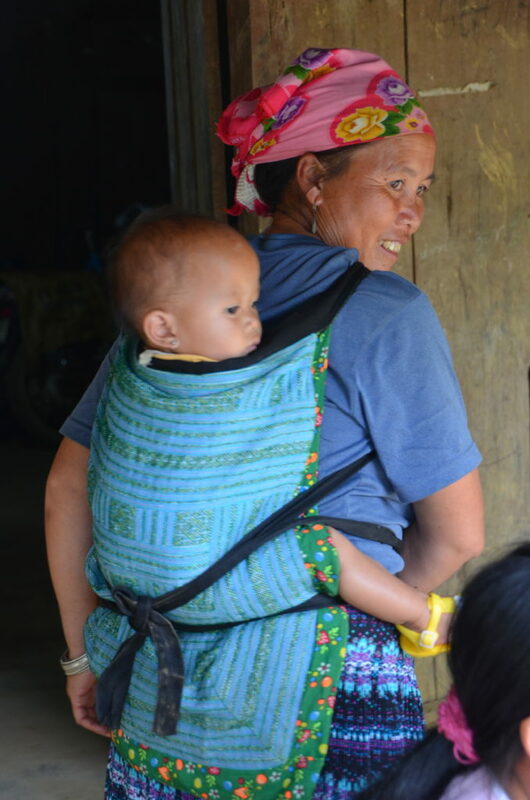 The multi-paneled baby carriers of the Black Hmong are renowned for their extremely intricate (and time-consuming to create) indigo-batik designs. 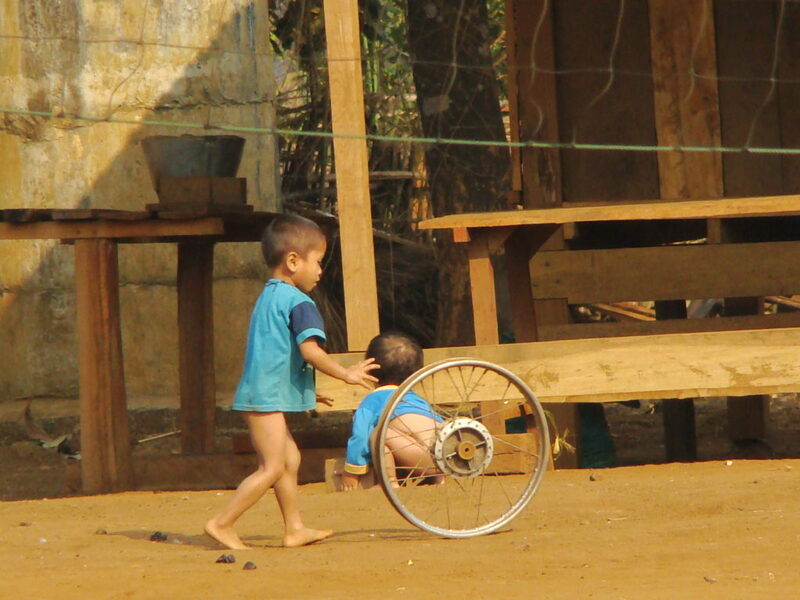 Once kids are mobile, perhaps age 1½ or 2, the entire village becomes their playground for about 3 years. In truth, we’ve yet to be in a small village where the prevalence of its youngest members is not central to the energy, cheer, and attention of the village activities. And yes – from this writer’s standpoint I’d say that they mostly get to “run wild,” as long as they stay reasonably safe, get along with others, and respond to an elder’s directive (assuming they’re within earshot…). 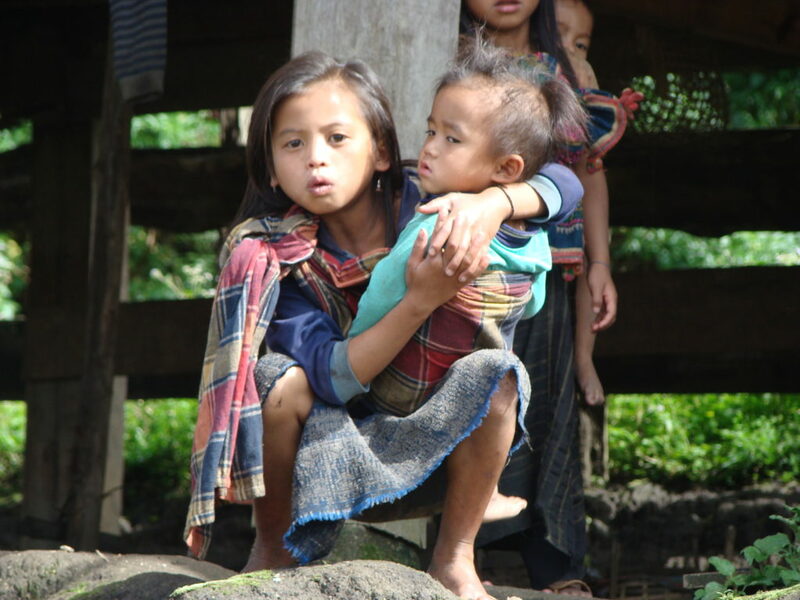 The 4 and 5-year-olds are often the first to greet a village visitor as they are out playing on the village periphery. From a textile standpoint, there is little to note here – quite literally – as these are often the “clothing optional” years for both boys and girls. Cool weather brings out cheap western-style shirts (and, if potty trained, pants). This older sisters helps care for her younger sibling. We notice that everyone in the village seems to carry responsibility for the young ones. Every adult or older sibling seems ready to help manage a youngest’s true needs. Indeed, one of the central tasks of the older children is to look after the well-being of the younger, just-mobile kids. Very often, older members of the community will look after the children during “work hours” while the able-bodied parents are off doing physical labor. The grandparents (who may or may not be grandparents by blood) seem to relish this supervisory role as they sit in the shade of their home surrounded by the buzz of youth at play. The elders are often involved in a home-bound task, perhaps shaping bamboo strips for basket weaving or spinning cotton with their spindle. As in many village-centered cultures around the world, grandparents often act as “first parents” to children, at least during the day. But we also note that the small kids do tend to care for themselves and look after each other quite well – grandparents are called on only for more serious boo-boos, or perhaps to put together a meal. And toys? Don’t get us started! Every old bicycle tire, every stick or plastic bottle, every rain-swollen ditch, every ball (whether store-bought or a wrap of rags), every puppy and frog and bug and puddle, every thing you can grasp in your hand – Oh my gracious! – The world is so full of treasure when imagination and friends are sailing together at full mast! 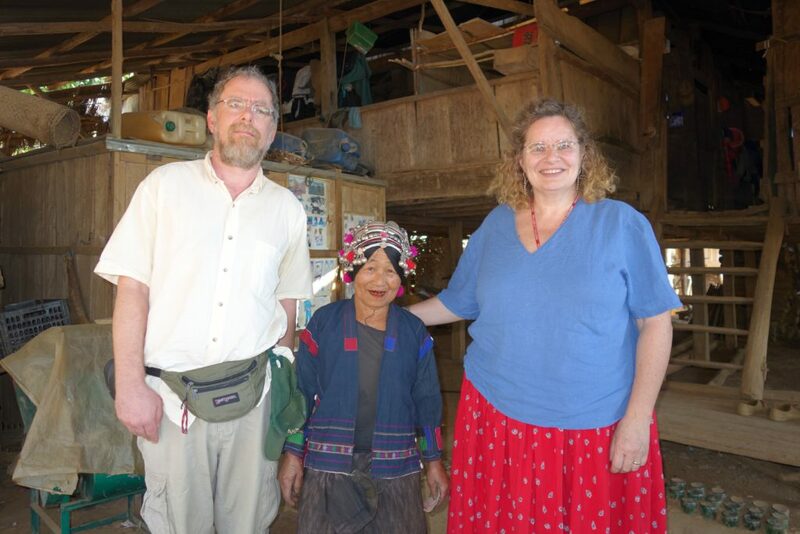 Maren meets the young Welcoming Committee in a Khmu village near Muang Khua in central Laos. A young girl, perhaps 6 years old, sits upright on the loom’s bench in the shade of her family’s home; you can see the creases of concentration on her brow as she pushes the shuttle through the shed that she had carefully lifted with her weaving sword. Her grandmother sits on a stool next to the girl’s loom and, although busy with her own lap-bound textile project, she occasionally offers a few soft words to the girl. 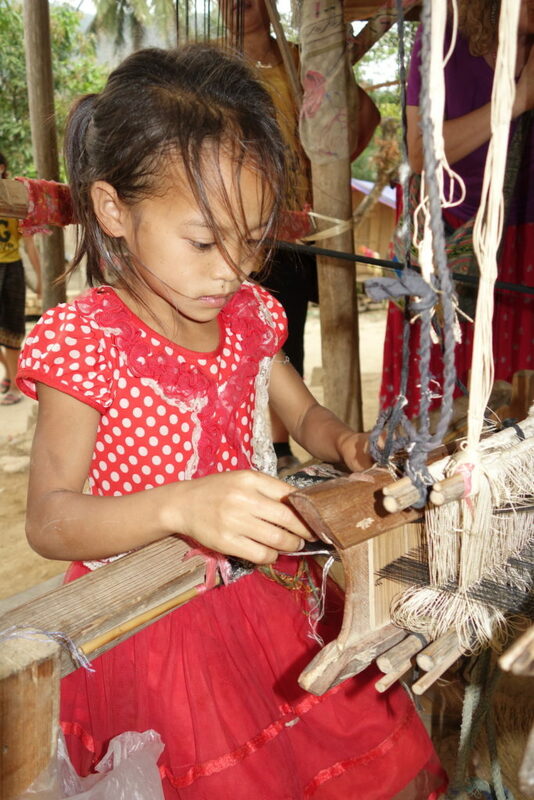 It is the first week of the girl’s official weaving lessons, and she does look serious sitting at her own loom, her silk project stretched across the warp and weft threads in front of her. 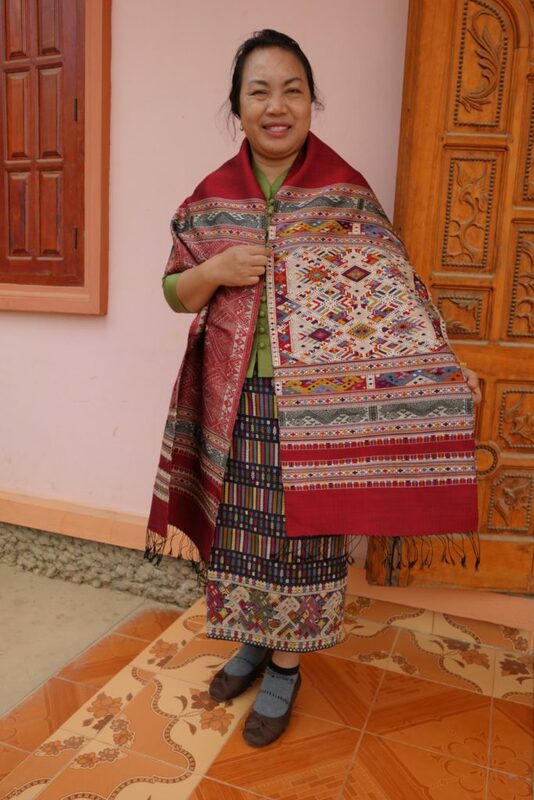 Granted, the young artist-in-training has for years been watching her elders daily at the loom creating the textiles that both transmit the knowledge and mores of their culture and support the economy of the community. 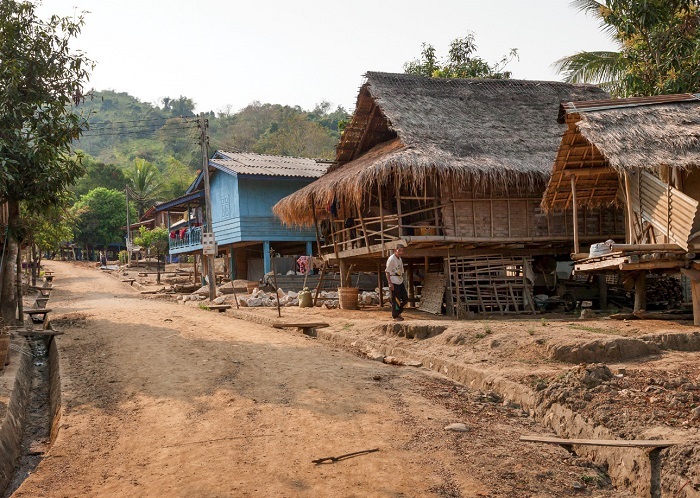 And in this village – Xam Tai, Laos – about 90% of the women weave. Occasionally, Maren and I share photos of young weavers, and often – and not inappropriately – there are queries about the pressures and expectations on the young workers. Indeed, are they being exploited? It’s a valid question, and the world is rife with examples of unhealthy child-labor situations. 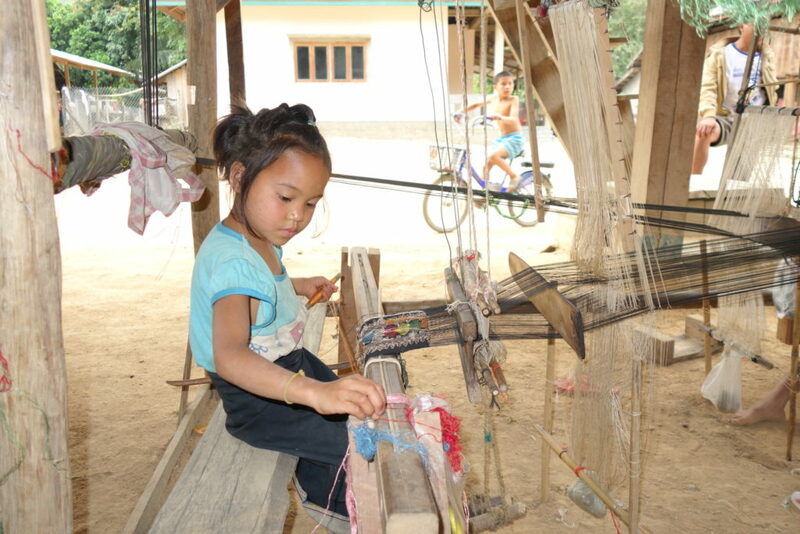 Mai Chom, 12 years old in this picture, shows us how her loom operates. 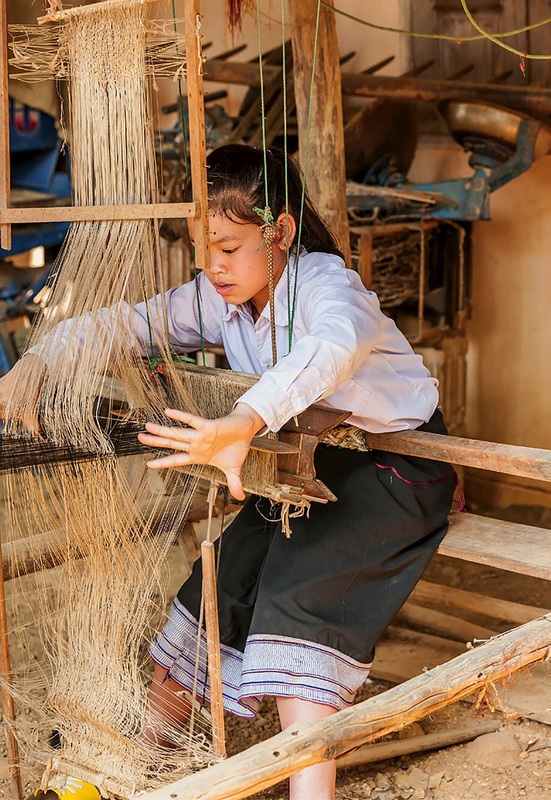 In Xam Tai, Laos (cultural home to some of the world’s finest naturally-dyed silk art), almost all youth attend public school from age 6 to 16 (usually 9-11 AM and 1-3 PM, 5 days a week). After school, each is then expected to assist with essential household and community tasks for 2-3 hours. 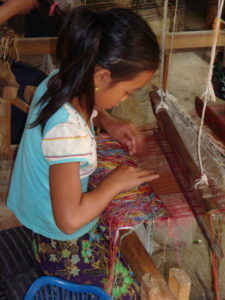 The boys are generally expected to join the men in fieldwork; the girls typically join the women at the loom. 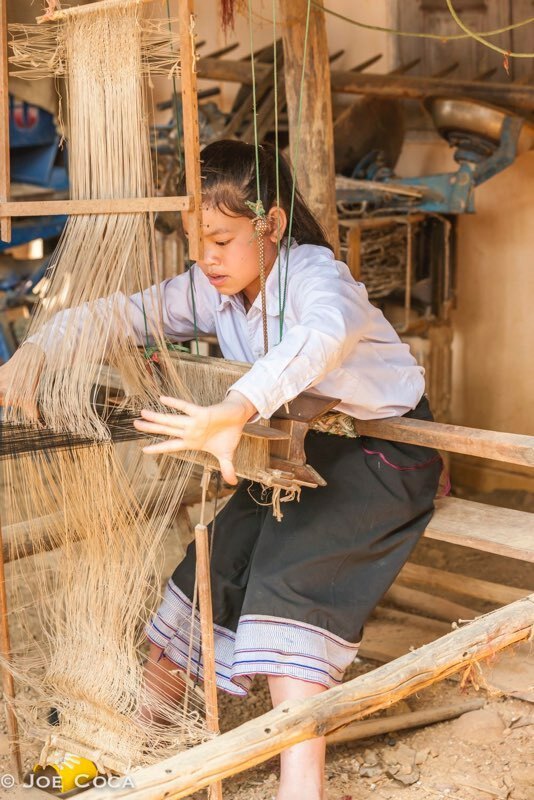 Some girls in Xam Tai choose not to dedicate their time to the weaving task – not everyone has the patience or skills – and other household or field tasks offer an alternate contribution. Also, during rice-planting and harvest time, all members of the community assist in the essential fieldwork. A young weaver works diligently as she hand-picks the silk decoration on her textile. In a modern, wealthy society, such task development for youth often gets channeled into the development of specific talents such as playing the piano, pitching a baseball, painting a picture, acting on-stage, or practicing ballet. The hours of work/play spent in such hobbies and extra-curricular activities certainly contributes to the individual’s development, and also has an impact on the broader community (albeit an impact that rarely plays to immediate needs). In fact, these activities are my culture’s means of transmitting cultural knowledge and mores. 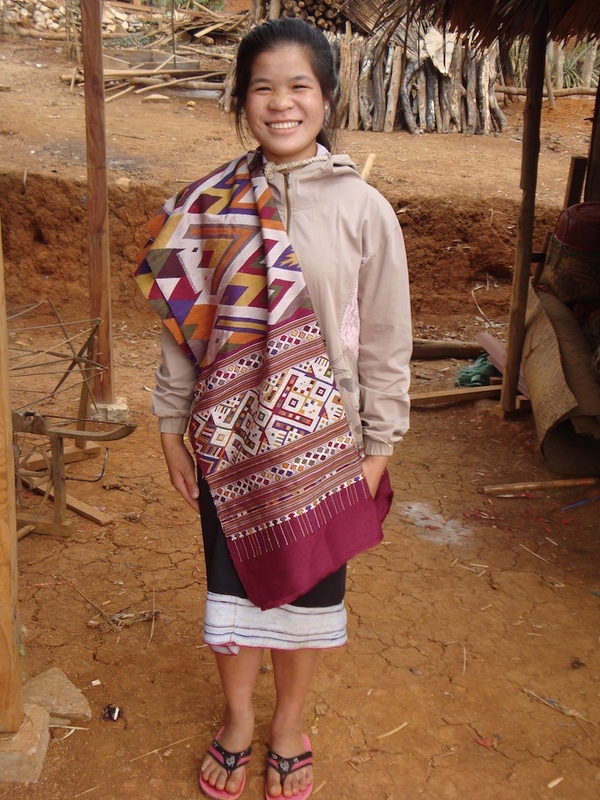 15 year old Ta of Meung Kuan, Laos, displays a ceremonial textile that she designed and wove of naturally-dyed silk. She weaves for about 3 hours a day after school. 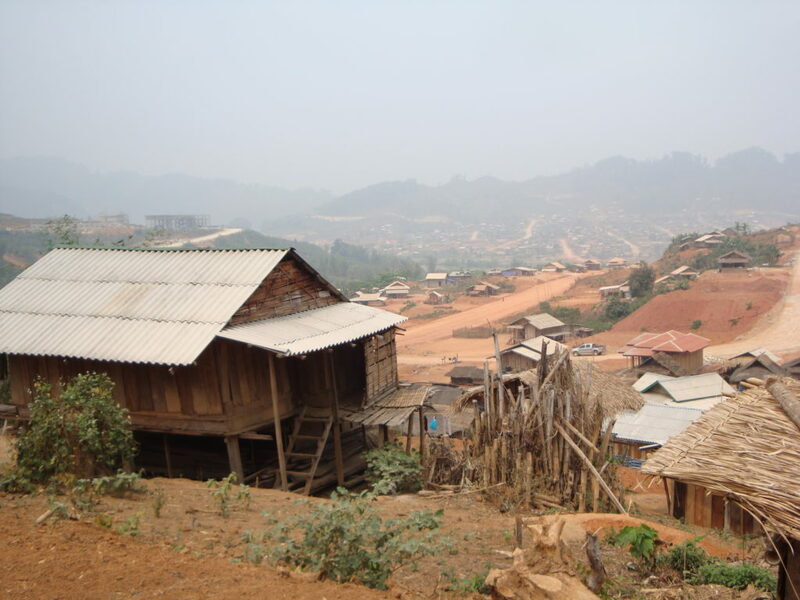 In traditional cultures, one’s time and participation tend to be closely tied to pragmatic considerations (especially if, as in rural Laos, subsistence living is in living memory). The pervading norm that “we must all contribute so we can all make it” becomes a dominant cultural voice, and a youth’s participation in supporting the larger community becomes the key vehicle for that youth’s maturation. Whereas some cultures might reward individual expression and “striking out on one’s own,” (indeed, even egotism), other cultures – especially small, traditional groups – hold more strongly to the ethic that the unity of the group and an ethic of “belonging-ness” supersedes the promotion of the individual. The cross-generational needs of the family and the economic and spiritual health of the community are priority. This photo was taken on this 6-year-olds first official day of sitting at her own loom. Her grandmother sat at her side instructing her. Pride in being a contributor – a “grown-up” – is clearly seen on the faces of the young weavers (as well as their parents and grandparents). Finally – mature enough to participate! As parents we saw that pride in 3-year-old Ari as he poured in the pre-measured washing powder at a laundry task, and as 7-year-old Zall joined in to help stack the firewood. The individual spirit lifts when we contribute to “real-world” tasks – when we’re a member of the “getting-it-done team” – and this pursuit of the greater good is a young person’s path to gain respect and skills. 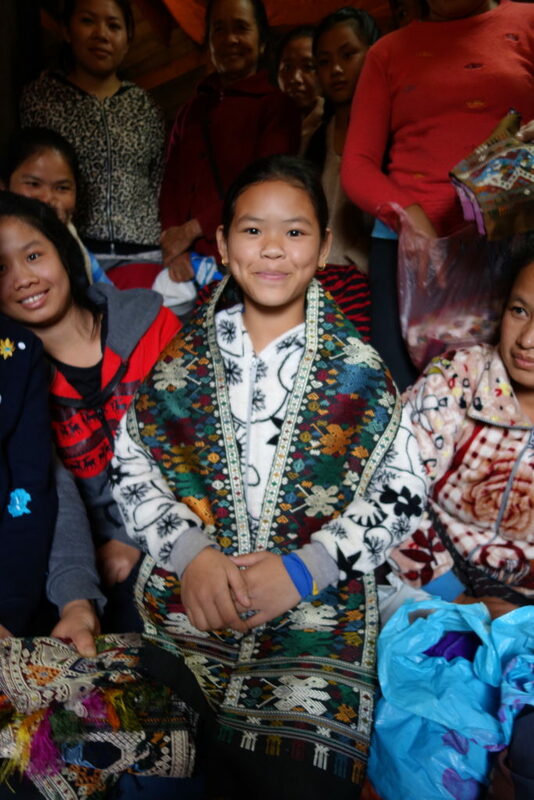 Mai Chom, who is 13-years-old this year, models one of her textiles in front of her community. We each weave a life, don’t we? the shuttle passes left, then right, like a pendulum. I weave the tasks I did not know I had chosen. never mindful of the growing cloth? Two small boys, one naked and one wearing only a t-shirt, ran blindly towards us laughing. They each held a stick and they were taking turns whapping a bicycle tire frame to continue it on its bumpy path. Looking up from their game, they saw us four falang– Maren, myself and our 12 and 9 year-old sons, Ari and Zall – and they both stopped mid-stride. The tire itself rolled forward another 20 feet, directly into Maren’s outstretched hand. She smiled: “Sabaidee,” she greeted. Before Ari could answer, another boy came running up shouting ”Hellowhatisyourname?” Ari pronounced his name for both, and then each boy asked Zall his name. Zall’s “z” sound proved a challenge and the boys smiled as they tried to turn a buzzing “zhhhh” into a delicate “zzzz.” We all laughed at the bee-hive sounds. Typical site under a home. Two more children joined. Everyone wanted a turn with “Hello what is your name?” and we were finally rescued from the lengthy introductions when a woman emerged from the nearest home tightening her sinharound her waist. “Sabaidee,” Maren nodded towards the woman, pressing her hands quickly together under her chin in the traditional greeting. “Sabaidee,” the women returned with a bright smile and a casual bow and hand-press. She pointed to our two blond boys and says something that made the gathered children laugh. 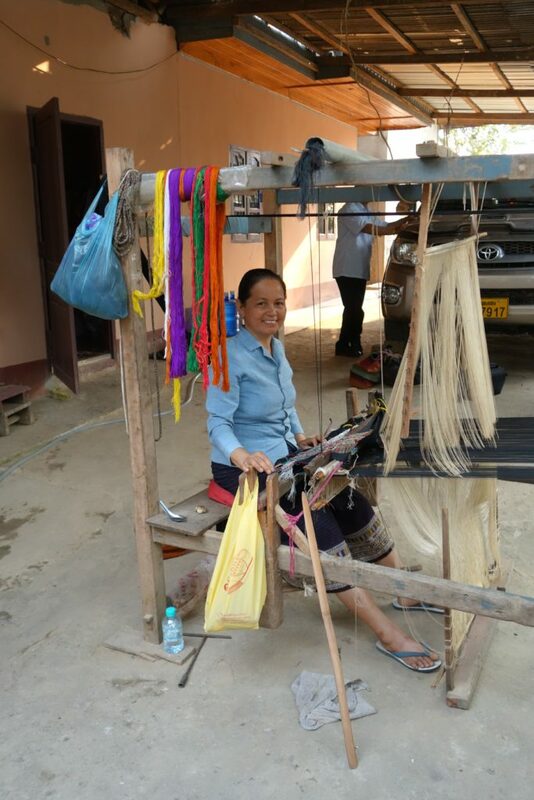 Our guide and translator, Kaiphet, quickly stepped up from behind us, introduced us, and inquired as to whether there were any weavers in the village. 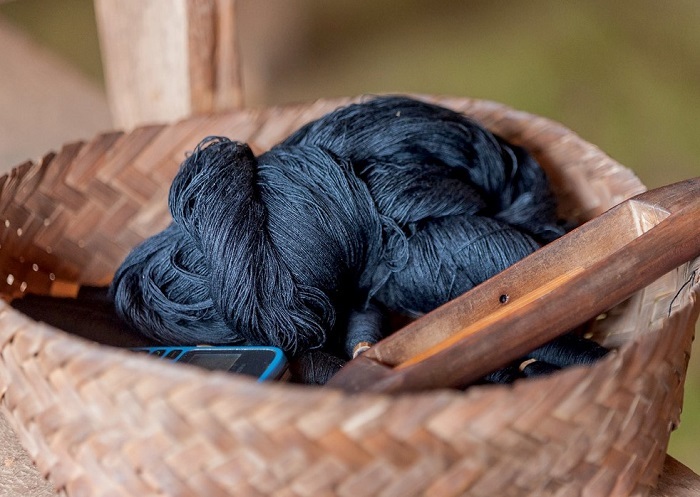 We had read in travel books about the traditional silk and cotton weaving of Laos’ Houaphon Province, and we had seen samples of the quality weaving in the Laos’ major hub, Luang Prabang. We had also seen outlines of looms under many homes as we had approached Xam Tai on the bus. The woman nodded and pointed to a bench in the shade under her home. With a wave of her hand, she invited us to sit on the smooth-worn benches under the home; we waited patiently as Kaiphet and the woman exchanged what we assumed were pleasantries. To our left sat a dusty wooden plow and a stack of aged cracked hardwood boards. On the right were several wide, handwoven baskets, each covered with a section of decaying brown tarp. 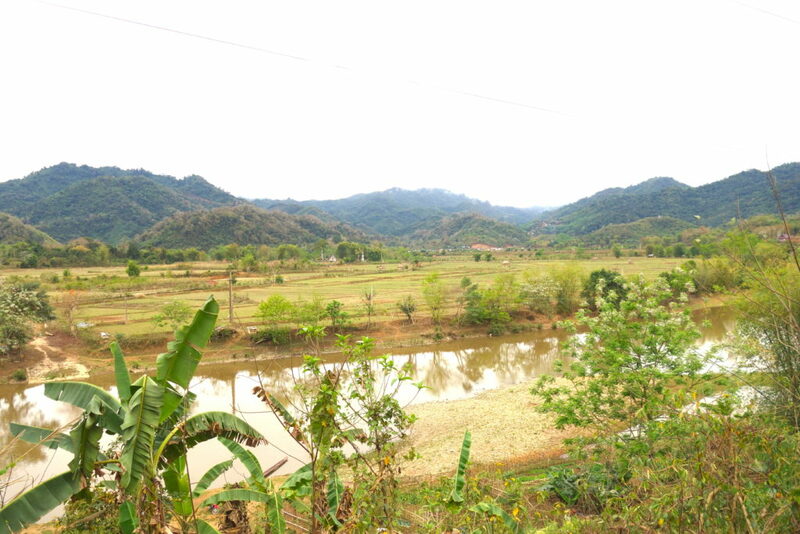 We had arrived in Xam Tai, in the southern section of Houaphon Province in NE Laos, at 3 PM after a 7-hour bus ride from Xam Neua over the twisty jungle mountains. We had deposited our packs in a cement box of room in the town’s sole guesthouse, and – what else to do? – walked the half hour beyond the central market and the bus station, past where the paved lane ended. 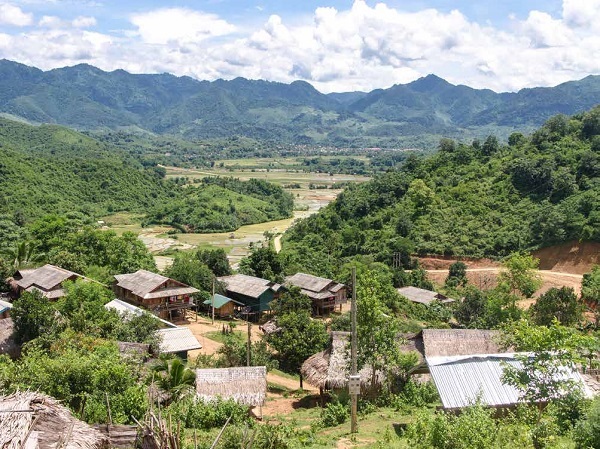 The rutted dirt road, far more suited for the motorcycle than the rare four-wheel-drive vehicle, tumbled over a hillock and brought us to old Xam Tai’s several dozen homes, the older residential area. One main road cut down the neighborhood’s center; raised-stilt homes, a few with thatched roofs but most with metal, lined both sides. More homes straddled a thin, rutted lane behind the front row of houses. Surrounding us were dusty browns and tans, from the house’s aged wooden posts to the unfinished crude boards of the houses’ siding to the thick dry roof thatch. A band of the close-by forest’s deep jungle green edged the periphery. The sky was hazy blue. The woman stood up, re-tightened her faded cotton sinh, and beckoned us to join her around behind the stack of lumber to what looked like a four-post canopy bed; she shoed a couple chickens off a worn stained sheet that covered a structure that looked like something that might hold a narrow mattress; she pulled off the dust-cover. The complex four-posted loom apparatus was strung with a dizzying, seemingly chaotic array of brown string, pink plastic ties and smooth-worn sticks. The extended warp, which wrapped across, up and over the loom, glowed with rich red. A glimmer of supplemental color – a bit of purple and yellow – danced a hint of expression on the front bar of the loom; the rest of the completed textile was hidden, as it had been rolled tightly during the weaving process with the bottom-side up onto the loom’s rolling front bar. The woman disconnected the front bar and delicately unrolled the completed 3-foot section, making sure not to create excess tension on the still connected warp threads. With a smile she backed up so we could see the textile she had in progress. The silk shimmered like a jewel – a burst of opulence and intricacy and precision in reds and yellows and purples that reached deep and sure. The bold Escher-esque geometric design – Was this an elephant? Was this a man standing? Was this the rice awaiting harvest? – defied the “simple-ness” of our surroundings. We look closer. A thousand – no, a hundred-thousand – threads of spirited color has been cajoled and tamed into a woven dance of the exquisite and refined. A weaver models her newly-woven shaman’s shawl. The silk is locally-raised and naturally-dyed. “Please, show us how?” Maren asked in English. No translation was needed. The woman sat down on the worn bench, re-rolled the textile onto the bar, adjusted a plastic tie attached to the comb, lifted a wide set of threads with a wooden weaver’s sword, and passed her hand-smoothed shuttle between the threads, adding another line of red weft. We sat mesmerized for several minutes, watching her pass the shuttle across the warp, and then hand-pick a selection of bright silk threads across each weft row. “Sabaidee-ee,” they smiled back, also holding the last long-e tone an extra beat. One of them said something and the weaver broke into a bright grin. The weaver didn’t miss a beat, continuing to work her hands, methodically picking the discontinuous supplemental color-threads into the textile’s exposed backside. Three young, bottom-naked children appeared from the home and clung to the two women’s knees, staring down at us from the overhead porch. Ari, our 14 year-old son, offered them a wide grin; the three little boys stared. One pointed and said “Falang.” The other little boys quickly repeated: “Falang, falang!” Ari nodded at their welcome, which literally means “French,” but today refers to any westerner. Zall, our 11 year-old, raised his ever-present Nikon and snapped a shot of the boys clinging to their mothers’ legs. Maren leaned down close to the woman’s loom to study its intricacies. The weaver kept working, knowing she was being studied. Two more children, perhaps 9 or 10 years olds in grubby t-shirts, sagging shorts and flip-flops, ran over to join the growing crowd, bringing with them a dog and a whirl of dust. A chicken with a fleet of chicks scurried by our feet and ran out of the cool of the home’s shade. 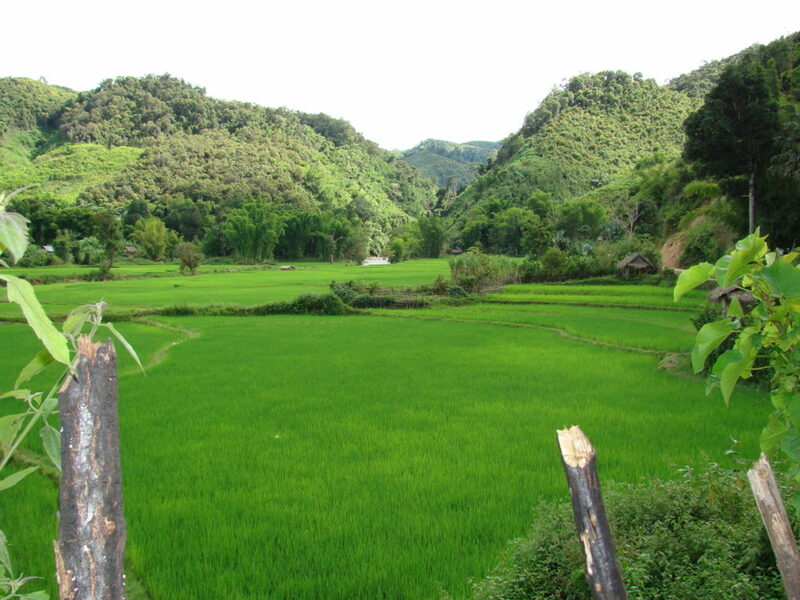 The Xam Tai district is gorgeous! “What is she weaving?” we ask Kaiphet. Kaiphet translated the sentence into Lao and received a 3 sentence reply, and then turned to us. The woman continued to weave on the large floor-loom, sending her worn wooden shuttle back and forth on the silk warp threads. Another older woman appeared from a home behind the first; in her left hand she held a few folded textiles. She said something quick and sharp to the two boys, and one dashed off towards where the elder had come from. An older girl brought out a plastic pitcher of water and three glasses, and we all shared a turn refreshing ourselves. Two more people arrived – a toothless bent man wearing black-framed glasses and a young woman with an empty a backpack basket who appeared art least 9-months pregnant. They stood off to the side, joining the now-dozen children, and watched intently. Souksakone, Xam Tai’s leading master-dyer, template designer, and weaver. Other women and children gathered to watch and listen, and a couple older men, and another pitcher of water appeared. They smiled between themselves as they listen to our strange words, then our translator’s struggling enunciation, and finally the weaver’s concise answer. A stack of silk textiles appeared, and another woman unfolded a creation and held it up to her chest so we could see the full dance of her phaa sabai. A bevvy of sharp-angled two-headed serpents dove through each other, purple over gold, in a sea of shimmering green and maroon. Maren and I laughed at the beauty and movement. Maren asked a few more questions through Kaiphet, but the more detailed information Maren sought about the source of the silk and the meaning of the pattern proved the limit of Kaiphet’s English. Kaiphet looked a bit embarrassed. “No problem,” Maren said to him, “Bo penyang.” Kaiphet smiled at the Lao expression. “Does she have any textiles for sale?” asked Maren, eyebrows raised. Kaiphet translated and the weaver nodded and turned her head upward toward the two women on the porch. She rattled off a paragraph of information. One dashed inside, we presumed to get whatever she might have for sale. The boy who had earlier dashed into the home brought out two cheap blue plastic chairs and nodded for Maren and me to sit down. Our boys, sensing another hour at this home, sighed, and looked around at the 15 or so kids who surrounded them. Ari dug into his daypack and pulled out a frisbee. “Come on, Zall.” The two dashed out onto the main track. The local boys watched Ari and Zall toss the frisbee three times, and then the fourth time Ari zipped the frisbee to the boy who brought us a chair. The boy ducked and laughed, then ran after the crashed frisbee and attempted his first ever frisbee toss. Everyone laughed and ran to where the frisbee had landed. Maren and I knew that every boy 14 and under would be entertained for at least half an hour. Two more women arrived along with several more children who looked anywhere between 3 and 12 years old. The boys ran to join the new-found game; the girls gathered around their moms’ legs and the loom. A moment later three more women came scurrying around from the road. There must now have been 20 people crowded around, not counting the dozen boys playing frisbee out in the road. Then a bustling, weathered woman charged in shouting what sounded like instructions to all of us. Slung across her shoulders was an old worn purse so large that she almost could have fit into it herself; stuffed into the bag was a jumble of hastily folded rich-colored textiles. I think I actually heard Maren smile. 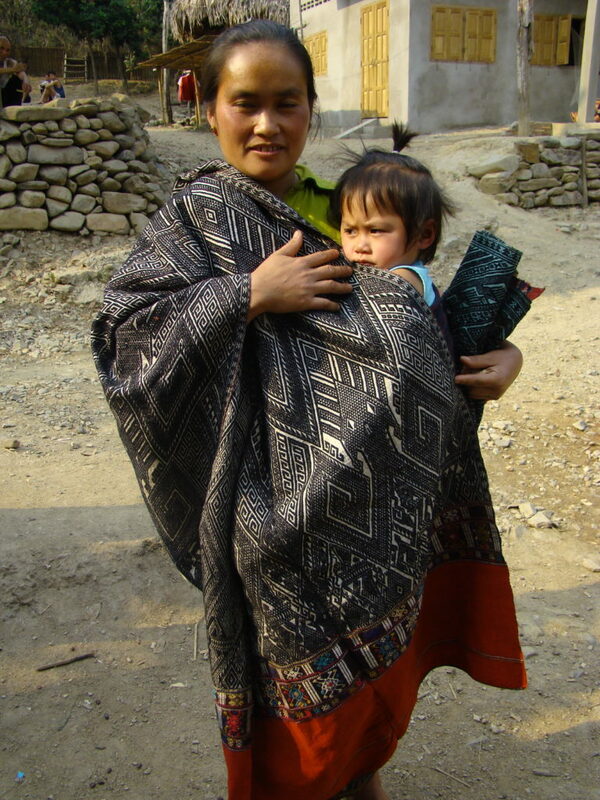 A woman in Xam Tai poses with her baby and handwoven healing cloth. The short pugilist of a woman grabbed a silk from her purse and shook it at Maren. She shouted a few sentences – two women looked down sheepishly, and another laughed behind her hand. The original weaver returned, carefully clutching several neatly folded shimmering silks. She presented the stack to Maren with two hands and a little bow, and then stepped back, glancing at the elder. The older woman scowled and spat out another couple sentences. The second woman laughed again under her breath, which inspired the sour-looking elder to throw out a few more quick lines. Kaiphet chose not to translate her words; we chose not to ask. Maren picked up one of the original weaver’s silks and unfurled the opulent body-height tapestry. Rich gold threads, highlighted with sparks of deep green and blue, detailed the popular siho(mythical elephant-lion) motif. Ancestor figures, each riding the siho’s back, shimmered in the sun. Maren took her time to admire the piece with her eyes and hands, chortling subtle “oooohs” and other under-the-breath accolades at the complex artistry. The elder, eyes blinking rapidly, waited perhaps 5 seconds, and she shook out one of her textiles and pushed it into Maren’s hands. She spoke in a rushed high tone. No translator was needed to tell us what she wanted. “Sii tomasat!”the woman grins, surprised at Maren’s Lao. The elder threw out another couple quick lines – one of the words was tomasat– and then she burst out laughing. The other woman all smiled. “Mai Lao? Mai Viet?”Maren continues (Lao silk? Vietnam silk?). The elder pushed a second textile at Maren, and Maren continued to ignore her, directing her full attention on the original weaver. “Mai Lao,”the woman answered proudly. She then rattled a sentence off to Maren, who turned to Kaiphet. The elder grabbed a third textile from her purse and held it directly in Maren’s vision. Maren turned toward the scowling woman and explained in English, and a flurry of hand signals, that while she would get a turn, but that we were currently talking with this other woman. Kaiphet didn’t translate Maren’s words, but he does say something short that gets everyone, save the elder, to crack a smile. The elder, unperturbed, yanked now a fourth textile from her purse and held it up to Maren. Maren and she locked eyes. The elder squinted, and pushed up her lower lip to form a deep frown. She held her grim, sour mouth in a deep frown firmly for a moment, as if daring Maren. And then, finally with Maren’s full attention, she erupted into a wide smile. Grinning there in front of all the other women and Maren on that first day, Sukkhavit – for that is the elder’s name – held that clutched textile up for Maren to see. The women all paused, waiting to see how the stand-off would end. Maren raised her eyebrows at Sukkhavit, and then she too joined the wide grin. Sukkhavit chortled as if a great secret had been shared – and maybe it had. She reached up and shook Maren by the shoulder, as if waking her up. Then they laughed together. Sukkhavit didn’t let go of Maren’s shoulder. Through Kaiphet, Maren patiently assured Sukkhavit that her silks would be also admired and, possibly, purchased. Since she had arrived after the others, we explained, it would only be appropriate that she receive our focused attention after the others. Sukkhavit scowled as she watched young Kaiphet struggle to explain and, long before he could finish, she charged off on another quick sentence. The entire group of locals tried to suppress a laugh. Young weaver picking the supplemental weft color patterns from the back side of the silk cloth. Sukkhavit grimaced and coughed and threw out one-liners throughout the forty-five minutes that we examined the textiles of the others. We purchased several, and rejected several, and, because no one shared a poorly made textile, we made sure to purchase at least one piece from each woman. With everyone’s presentation came a sharp comment from Sukkhavit, most of which elicited a suppressed laugh from at least one person. By now it was obvious that this elder was the center of village politics. She had a reputation – perhaps, indeed, a dominance – that needed to be re-stated and learned given the new social venue of having us in town. Now she was firmly in the center, in control, making untranslated comments on every piece as we unfolded it. Finally, it was Sukkhavit’s turn. It turned out that Sukkhavit did have some of the most flawless and dynamic silks of anyone. Every piece she presented seemed rich and deep; each carried a special lustre. They were, quite frankly, the finest we had seen yet in the region – or anywhere else for that matter. We could tell she knew that, as well. Sukkhavit cackled with each piece of hers we set aside to purchase. She rattled off paragraphs of talk, rarely stopping for Kaiphet to stumble through a basic decoding. And suddenly Sukkhavit was treating Maren as if they were old friends. Indeed, both Sukkhavit and Maren seemed to have seen that each other’s take-charge exterior masked an inner soft spot. And both had much to gain with a good relationship. Ten minutes after that, all four of us, along with Kaiphet, were sitting on pillows on the deliciously cool floor of Sukkhavit’s home, a pitcher of filtered water and a bunch of tree-ripened bananas and tamarind pods in front of us. 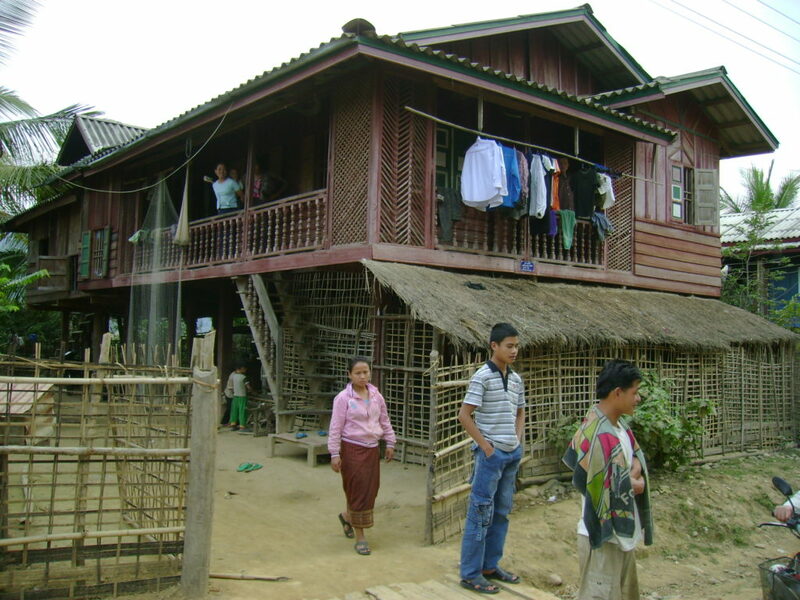 Sukkhavit’s home is built of well-rubbed teak wood and sits on stilts 7 feet above the hard-pack dirt; steep steps lead up to the low-slung doorway. Wooden shutters from the windows are tied back to bring in day’s light and a bit of breeze. An electric fan swung slowly back and forth slowly sharing it’s breath. Like most Xam Tai homes, the room is void of furniture, save a chest where a TV and radio sit. Thin interior walls, also of wood, are covered with Lao Beer advertising posters and “beautiful young women” calendars from the last decade. We chatted through Kaiphet for perhaps half an hour, with Sukkhavit leading the conversation. She spoke in sharp, short direct sentences – not angry, but what to me sounded terse and impatient. Her face was animated, smiling big with one response, frowning deeply with the next. She took a keen interest in our two boys and seemed extra pleased when they reached for their third banana (a young, silent niece restocking the bowl long before it was empty). She was also very interested in what we were looking for as a business, and we explained that we sought both traditional textiles and traditional craft-work, such as baskets and tools. She nodded and cut another quick line to Kaiphet. This acerbic-sounding delivery turned out to be an invitation for all of us to join her and her family for dinner the next day with her family and other guests – come at 5 PM. It’s the moment travellers always hope for – an invitation to participate on the inside – and we cheerfully agreed. Poor Kaiphet. At that next day’s dinner and extended evening, I have never seen someone work so hard to keep up. The event started with Sukkhavit luring us with a few more choice textiles, and we selected what made sense for our budget. Like most Lao business people we have worked with over the years, she set a firm and reasonable price for each piece; we bargained a little, and she gave just enough so we could all feel successful, but no one forgot who was truly in charge of the dealing. She then turned to a pile of other goods stacked in the corner. Sukkhavit, always the business-woman, apparently had scurried around town all day seeking possible items for us to buy for our business. Each item she obtained came with a presentation – no, a skit – where she demonstrated its usage. And with each skit the audience, that is everyone in the room, laughed appreciatively. Here was Sukkhavit as a H’mong farmer, picking greens and tossing them into her richly-patina’d backpack basket. Here was Sukkhavit as as a Tai Daeng fisherman, stirring her small triangle net in the stream and placing the small caught fish into the creel tied onto her waist. And now here was Sukkhavit the healing shaman, dancing a hop-step and shaking her bamboo “spirit-sticks” as if in a trance (and she actually had obtained traditional scarf with bamboo “healing-sticks” attached from a local shaman). Thankfully for Kaiphet, little translation was necessary during the presentation; laughter is understood everywhere. Sukkhavit’s husband, a kind man whose smile grows in proportion to the number of textiles purchased, passed me a shot glass of lao-lao, local rice whiskey, and he flicked his wrist in front of me to indicate I should toss it down in one gulp. I returned the empty glass and it is refilled and passed to the person next to me, and so on around the circle twice, and then again twice, everyone sharing the glass. Our boys, getting a nod from Maren and me, join the toast. Out of the corner of my eye I caught Sukkhavit luring 11-year-old Zall over to a wooden crossbow – what kid doesn’t like a handmade weapon! We had seen many boys in the area use such tools to catch catch rodents and small birds for dinner. Sukkhavit carefully showed Zall how to hold the crossbow and then drew an 18″ arrow from a woven bamboo sheath. She pointed to a corner of the room – perhaps to where the bamboo rat was to be – and helped Zall pull the string to a tight locked position and then load the lethal weapon. Zall aimed and Sukkhavit leaned over his shoulder like an umpire behind a catcher – her eyes, as were Zall’s, trained on the target. “P-shewwww,” Sukkhavit whistled as if the arrow had been launched (and here for a moment I thought she would actually let him launch the thing). She laughed and clapped Zall on the back, and then leaned over and gave him a quick grandma-like hug. Not a word had been translated; not a meaning had been missed. 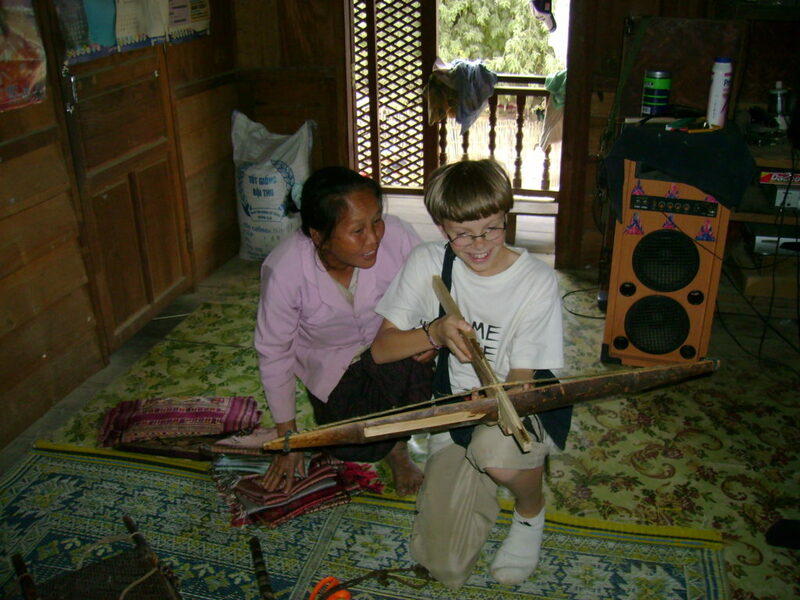 Sukkhavit and Zall playing with the crossbow on our first visit to Xam Tai in 2007. “A-li,” Sukkhavit says to Ari from across the room, and she shuffled over to him. With her hands she motioned for him to stand up. Ari got up slowly from his cross-legged position, and, as he maneuvered his feet under himself, Sukkhavit leaned back in mock amazement at his rising frame – at 14-years-old he was a full head taller than she was. She flapped her hand ceremoniously several times as if preparing to perform a magic trick, and then she reached up and grabbed Ari’s shoulder in a firm clutch. The room turned quiet as everyone watched. There was a moment of profound silence. She stared up at him with a faux-serious face and with her chin jutted out and cleared her throat. She ran her eyes over him from top to bottom, bottom to top, as if inspecting a soldier, or a side of beef. She rattled off a quick couple sentences, and I can only catch the words for “son” (luk sai). The room burst into laughter, and she continued her inspection. Ari smirked, and looked a little embarrassed. A woman sitting on the floor tossed a quick line, and then more laughter, and then another said something in an undertone and everyone laughed again. Sukkhavit’s firm face finally bursts into a wide grin. Everyone watched us intently, smiling and eager, while Kaiphet translated for us, and then we all laughed together on the shared joke. 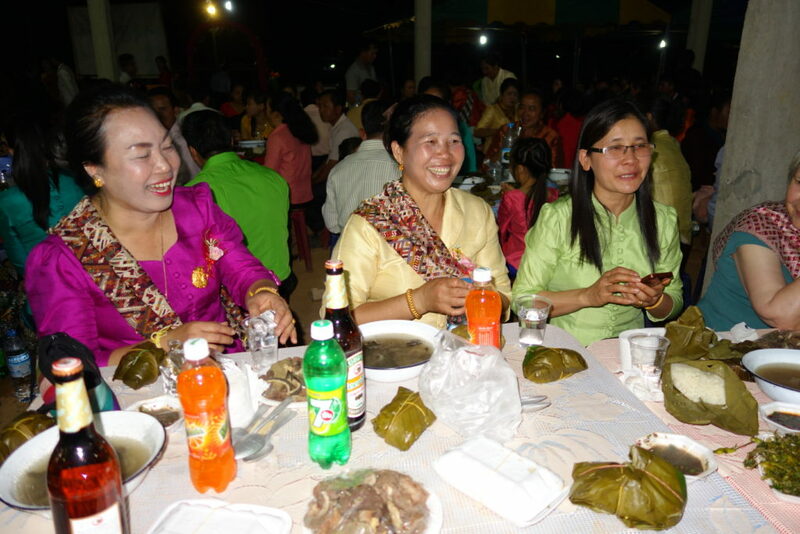 Suddenly everyone stood – “kinh, kinh”(eat, eat) ordered Sukkhavit – and the stacks of textiles and back pillows are pushed to the edges of the room. 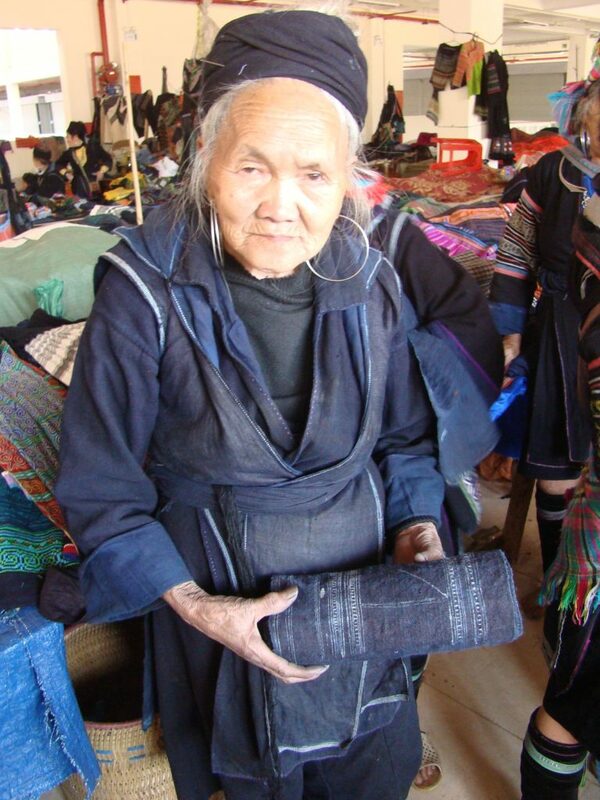 A young woman, one of Sukkhavit’s many nieces, rolled a blue fiberglass tarp about two feet wide and ten feet long onto the floor – the tablecloth. Pillows were re-distributed, Maren and me each getting two – perhaps as marks of honor, or perhaps because we bear bigger bottoms. Sukkhavit and Maren in 2009. Out from the back-room kitchen came steaming bowlfuls of laap (minced pork with banana flower, garlic, ginger and chilli), boiled chicken (we are honored with the chicken’s head and Maren does her best with it), chicken broth with onion and garlic greens, bowls of fresh, sweet spinach-like greens, plates of steamed bamboo shoots, and several woven basketfuls of glutinous “sticky” rice. We sat cross-legged on the floor, and Sukkhavit and her family made sure that the bowls of shared food at our end of the table were refilled long before they approached empty. Here’s a cultural tip for Laos: Don’t finish your portion. Because you can’t. An empty guest plate is the sign of a neglected guest, and you will be served food until you leave food untouched in front of yourself. Others will even politely do without to make sure you, as a guest, have too much. And don’t keep nibbling at the food once you’re full. Everyone is compelled to continue eating if a guest is still eating. Finish eating, leave leftovers, and be done. So everyone else can be done, too. 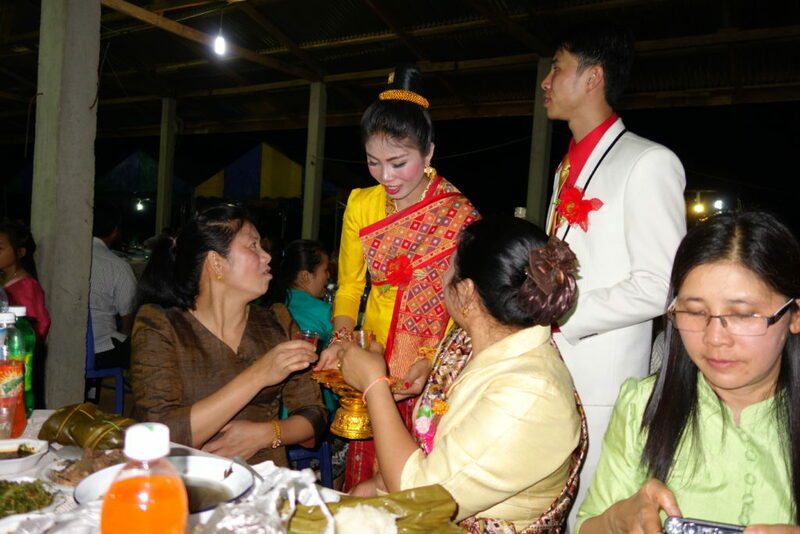 On that first evening I’m sure Sukkhavit shared about her family, but we kept no notes and we were all gabbing and striving for basic understandings …. and all relying on our dear poor 22-year-old translator Kaiphet for anything that couldn’t be mimed. So many people were introduced – even ten years later we get faces and names mixed up, and often can’t remember who is related to whom. After dinner we shared songs back and forth from our cultures – their beautiful and haunting Lao songs of love and friendship oddly balanced with our choice of nursery rhymes (although, in truth, singing a round of “Row, Row, Row, your Boat” went over quite well). Heads were drooping by 9 PM – dawn arrives early every day. With a dozen good-byes and well-wishes, we don our headlamps and weave our way back, smiling, to our simple guesthouse. Kaiphet walks with us, finally able to be silent. “I think we’ve been adopted,” Maren laughed quietly to everyone. I could feel the smiles around. This post was previously published at www.thrumsbooks.com, the website of the publisher of our recent book: Silk Weavers of Hill Tribe Laos: Textiles, Tradition, and Well-Being, and a site we’d recommend to further explore the role of textiles in today’s traditional cultures. 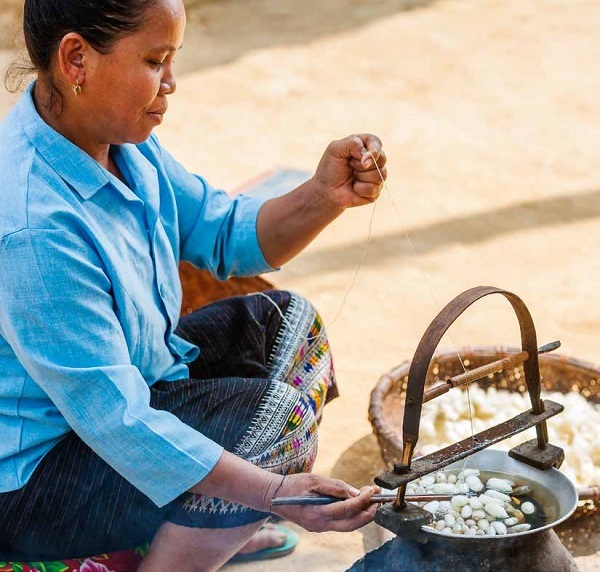 In 2008, in a small village in the beautiful Annamite Mountains of northern Laos, Maren and I met a Tai Daeng silk weaver who had sewn clever, flower-like tassels crafted from silk cocoons onto the fringe of a traditional healing cloth. We commented on how much we liked the decoration; it was an attractive visual detail. Returning to the same village the following year, we were surprised to find that virtually every textile offered had this flower-tassel. “We knew you liked them,” one weaver smiled. 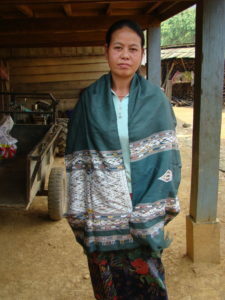 Lun, a master dyer and weaver from Houaphan Province, Laos, dons her silk phaa phi mon, or Shaman’s shawl. The silk is locally-raised, hand-reeled, naturally-dyed, and handwoven on a floor loom. Note the flower-like tassels! Photo by Above the Fray. The truth should be spoken boldly: Creators of textiles – at least those for whom weaving is a livelihood – weave foremost to satisfy an economic need; their investment in training, materials, and time must ultimately ”turn the wheel” of a household. Thus, every textile we buy, every color choice we make, every comment about quality or design that’s heard impacts the competent artists’ effort to meet their essential economic need. Ultimately, traditional textile creation must be pragmatic, as success for weavers depends on one’s time and effort being of predictable value. But this practical realization also finds its limits in our shrinking world. 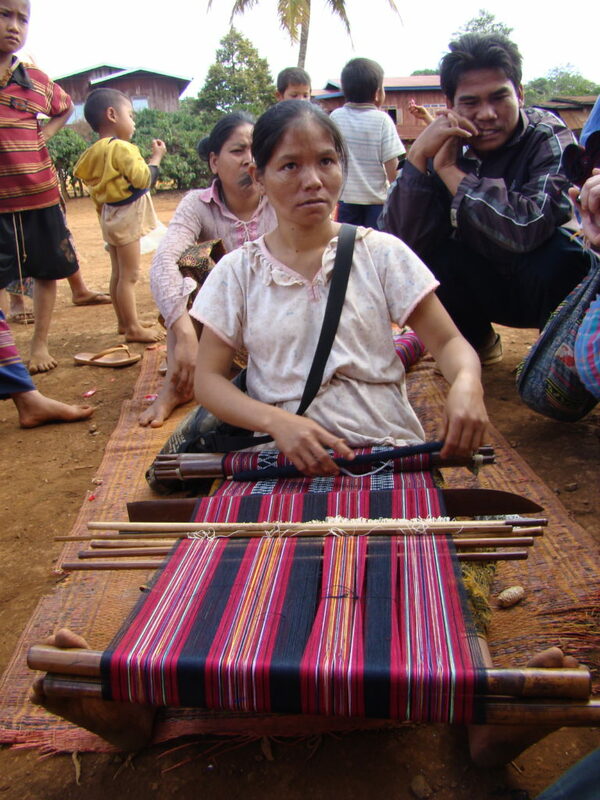 A Katu woman in Attapeu Province weaves a traditional cloth on her backstrap loom. 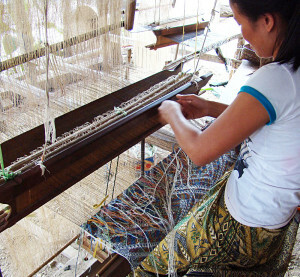 White glass beads are being woven onto the textile’s weft threads. The yarns are chemical-dyed polycotton. Photo by Above the Fray. 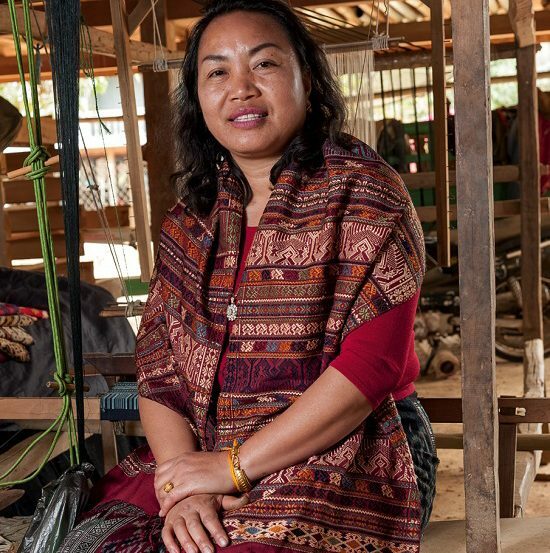 In a Katu village in Attapeu Province, southern Laos, we encounter a unique traditional woven expression: that of precisely placing patterns of beads on the weft threads as the textile is woven on a back-strap loom. Several generations ago, the Katu made their own beads from lead, poking a thin bamboo rod through a molten droplet to create the bead’s hole. These lead-beaded textiles carried a luscious chainmail drape (and rare surviving pieces now fetch hundreds of dollars a square foot). In the early 20th century, colorful factory-made glass beads became readily available, and the art of bead-making disappeared. By the mid-20tth century, chemical dyes were readily available, and the time-consuming art of naturally-dyeing cotton yarns was soon forgotten. Recently, acrylic yarns have replaced hand-spun cotton, and the regional skill and art of growing, harvesting, and spinning cotton has virtually vanished. Today, this Katu village still hand-weaves beaded textiles on back-strap looms – albeit for tourist sales. If plastic beads were to replace the glass, or if a mechanical device were to place the beads on the threads – would that textile still be “traditional”? At what point is the integrity of authenticity challenged? 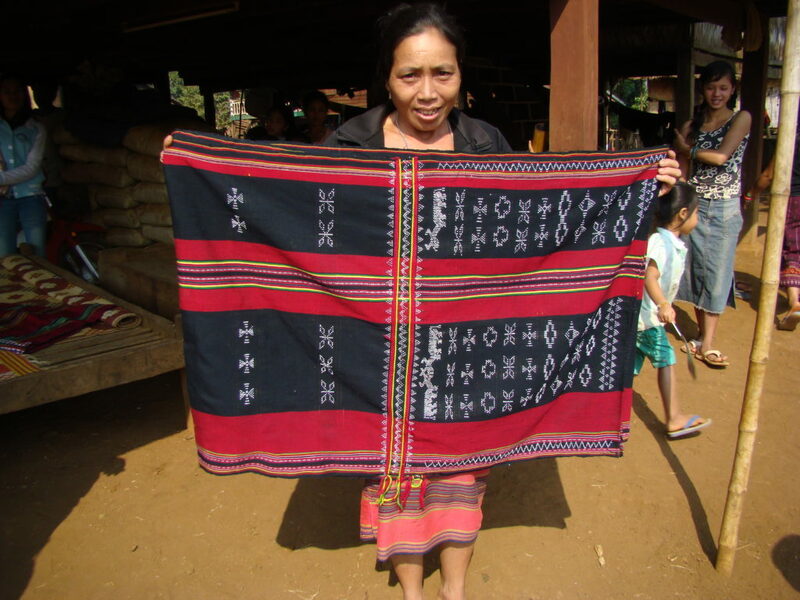 A Katu weaver holds up a stunning man’s ceremonial shoulder cloth that she recently wove. Photo by Above the Fray. 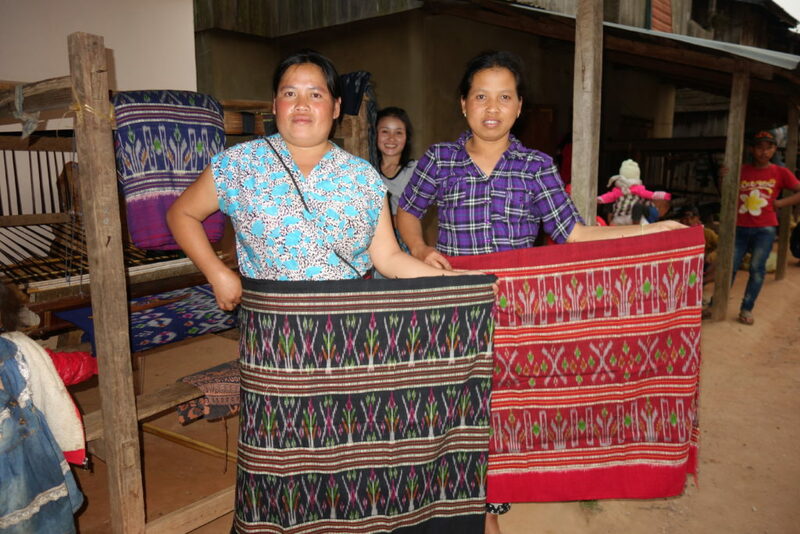 In northern Vietnam’s Lao Cai Province, the Hmong people can now buy rolls of chemical-dyed poly-cotton skirt fabric printed with the regional Hmong people’s traditional batik patterning. The rolls look much like the hand-spliced, handwoven, indigo-dyed wax-batik’d hemp that has been central to the local economy and to regional cultural identity for generations. In the marketplace, this factory-made fabric cost a fraction of what the local hemp weavers must charge. What does makes a textile traditional? – Its design? Its artist? The artist’s culture? The method of creation? The label, or purveyor? The textile’s “story”? Supporting traditional textile art, artists and cultures by definition impacts the art, artists, and cultures we seek to celebrate. That is, our support generates change. From the artist’s vantage point, this dance of inviting modernity while participating in one’s cultural heritage is a tight-rope walk with far-reaching effects that unfold over generations. First, for traditional textile designs and processes to remain vital and vibrant, the marketplace must fairly support the value of the creator’s time. Ultimately, a textile that doesn’t “turn the wheel” won’t be made. And second, the voices and stories of the world’s traditional textile artists must be heard and shared. And here I’ll recommend exploring the breadth of cultural voices in the books offered by Thrums Books. Maren and I never chose to be textile enthusiasts or authors, of Laos or anywhere else. Nor was this destiny inherited, or even anticipated. We kind of just . . . uh . . . followed our curiosity. We began our adult lives together as cultural adventurers, not textile enthusiasts, and many highlights of our 34 years (and two children) together involve backpacks and rural Asia. Our curiosity about how others lived, especially those with fewer modern amenities, has always fueled our itch to explore. We also reveled in the stories—and bonds—that such adventures create. Xam Tai’s beautiful valley. 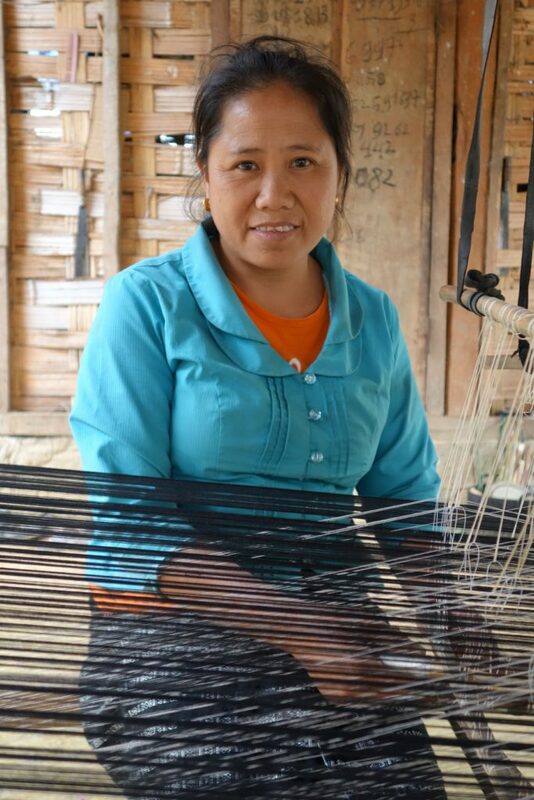 Photo by Josh and Maren from Silk Weavers of Hill Tribe Laos. 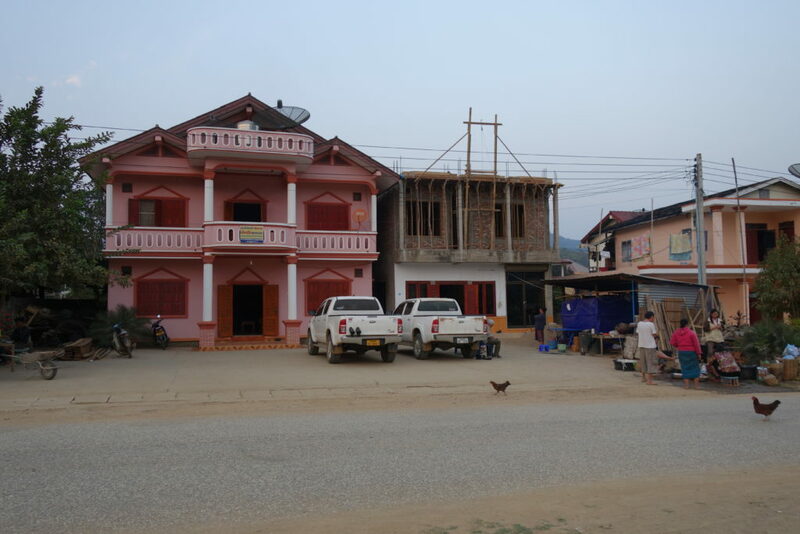 However, our first visit in 2007 to the extraordinary silk-weaving village of Xam Tai in Laos’s remote northeast corner (told in our book’s first chapter) portended a new direction for adventuring, as a door was opened that allowed us to delve deeper. 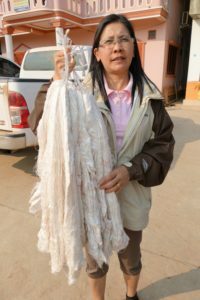 This time our curiosity welled from a different fount, and it propelled us seek not a broad experience, but rather the details of a people and their incredible textile-based culture: How does Seuk raise the silkworms, and reel their filaments? How does Souksakone, the dyer, extract the red from the excretion of a scale bug? How do the mechanics of the clever “supplemental heddle system” on Phout’s hand-built loom create and save the complex patterns? What are the meanings behind the other-worldly motifs on Lun’s healing cloth? Seuk reeling silk from the steaming water in the reeling pot. 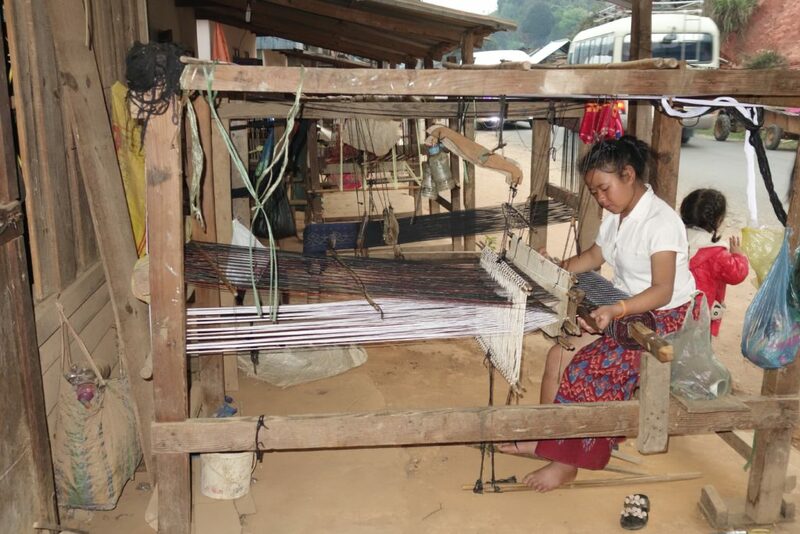 Photo by Joe Coca from Silk Weavers of Hill Tribe Laos. Our experiences, research, and developing relationships eventually pursued more profound questions as well: How does this unique and intricate textile art, which dates back to the dawn of the culture, support the economic and spiritual well-being of the region’s people? How does it transmit their inherited cultural knowledge? How did this textile tradition come to be? How are the art and people reacting to today’s rapid modernization? What does the future hold? Maren and I also have come to understand that the more we learn, the more timeless and relevant the story of these traditional weavers and their art reveals itself to be. 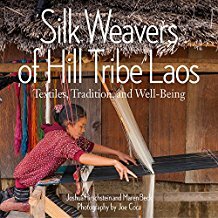 Upon reading Silk Weavers of Hill Tribe Laos last month, my brother expressed surprise—and gratitude—that our “textile book” shared stories and personalities. He commented that he truly felt like he was “soaking up the village scene” and sharing time with the locals, which in turn made their history and art seem that much more approachable. The following week Maren’s mom, past president of the Seattle Weaver’s Guild, expressed appreciation for our meticulous descriptions of the silk raising, weaving, and dyeing processes and the depth of ethno-historical information. She was drawn to our book’s precise and supportive detail. Phout of Xam Tai at her loom. 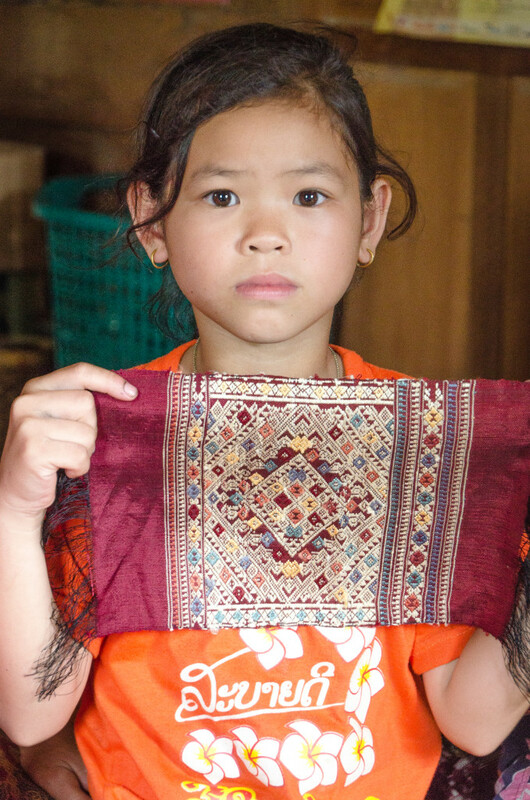 Photo by Joe Coca from Silk Weavers of Hill Tribe Laos. Our publisher, Linda Ligon, wrote last month in “Weaving off the Beaten Path” that we had told her we wanted to author a book that “would not be like any other book Thrums had ever published.” (Thanks for being undaunted, Linda!) That is, we wanted a fun-edged telling that introduces story and personalities to lure the cultural enthusiast and armchair traveler into the ever-more-tantalizing details (just as we were pulled in). We also wanted to present clear and relevant facts and description to satisfy the punctilious textile enthusiast, while still intriguing that reader with a rich and supportive cultural experience. We wanted a book that engaged the curiosity of both my brother and Maren’s mom. We also wanted a book—and here we can celebrate the entire line of Thrums Books publications—that supports the relationship between culture and craft, craft and artist, artist and appreciator (i.e. the marketplace), and appreciator and culture, as the health of this cycle ensures the relevance and vitality of human creativity and traditional arts. So a special thank you to Thrums Books, for allowing us an opportunity to share a tale of a most amazing people and their inherited art-form. We hope everyone enjoys the story. Oh, and the details, too! The cover of our publication, now available (autographed!) at www.hilltribeart.com or your favorite bookstore. 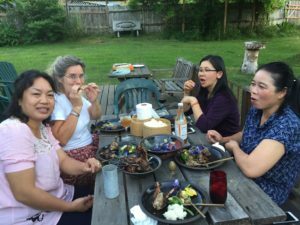 Phout, Maren, Malaithong and Souksakone enjoy a late evening barbecue on our porch in Eugene, OR. It was a decade old dream come true. 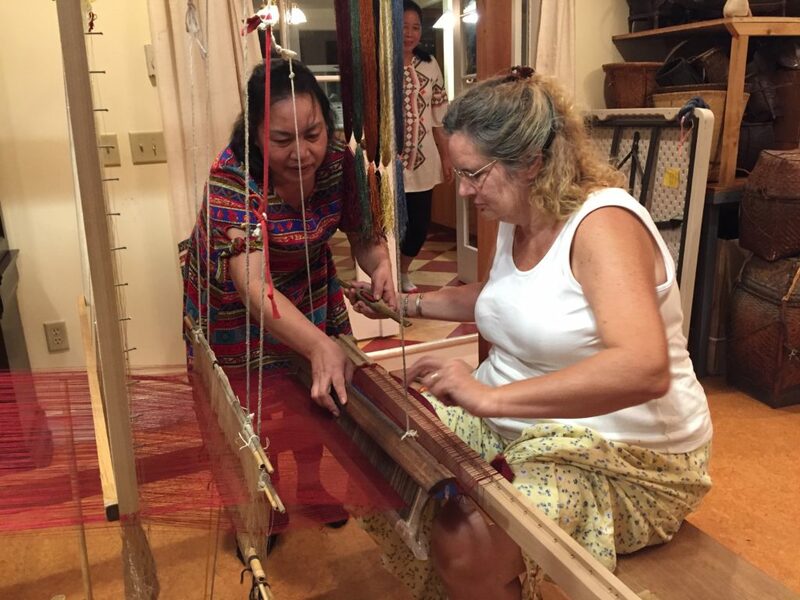 Rather than Maren and I visiting our wonderful Lao weaving friends in their village in Laos, we finally “got even” by having them visit us on their first ever trip to America; for weavers Souk and Phout, it was their first time outside of SE Asia. 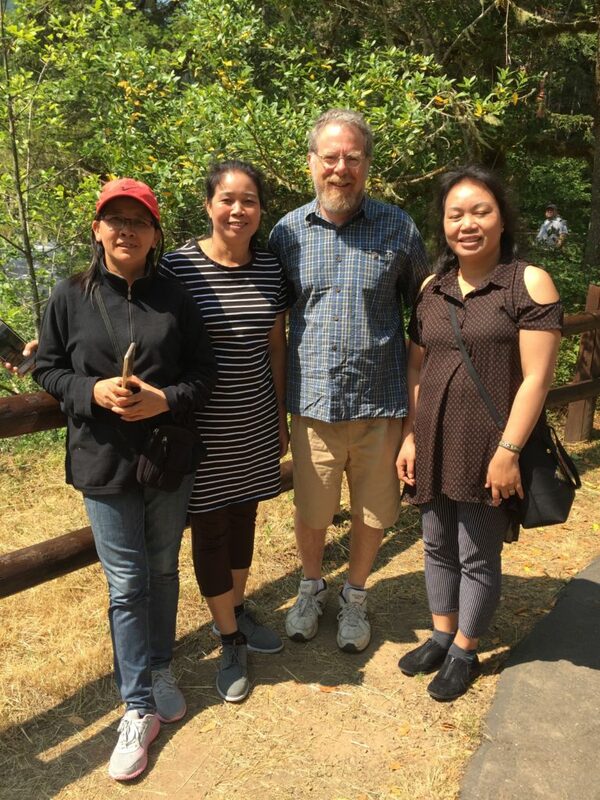 They were able to bring childhood friend Malaithong with them for her translation services and to help facilitate the business and adventure opportunity. 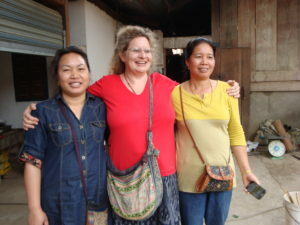 These are three precious friends of ours who we met a decade ago in Xam Tai, Laos when we first started Above the Fray, and their work has been central to the finest quality silks that we offer our customers. Souksokone, Malaithong, photographer Joe Coca, Maren and Phout at the Santa Fe Folk-Art Market. The first week was spent in Santa Fe, where they were welcomed as special guests of the exquisite and selective Santa Fe Folk Art Festival and Market. 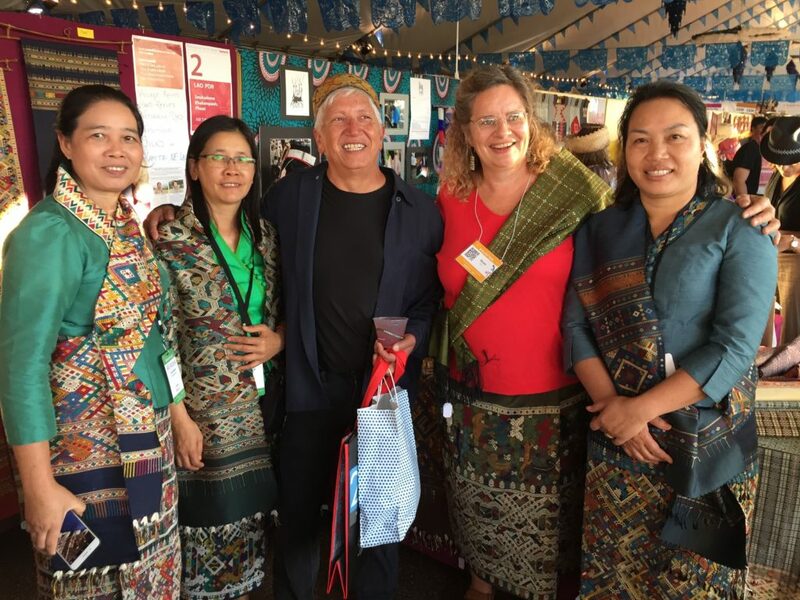 For two days the jet-lagged weavers attended workshops that introduced them to American business and marketing, and then they sold some phenomenal textiles in the marketplace. Maren and I flew down to assist with the sales and cheer them on. The crowd was dense and receptive, and they did well with sales. Many attendees complemented those Lao weavers, dyers and designers as the highlight of the 150 or more represented artists. Phout and Souksakone’s first visit to a Whole Foods Supermarket. So many things! 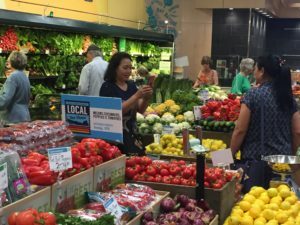 Watching them take photos in the produce section of Whole Foods – what a selection of greens! The wine department was overwhelming, and just how many kinds of cheese are there? Getting to throw a first snowball ever, while enjoying the views at Crater Lake. Watching forests glide by the car window for hours. They agree that our life-style here is very tomasat – that is, based on the goodness of being natural. And the roads are so smooth and fast! 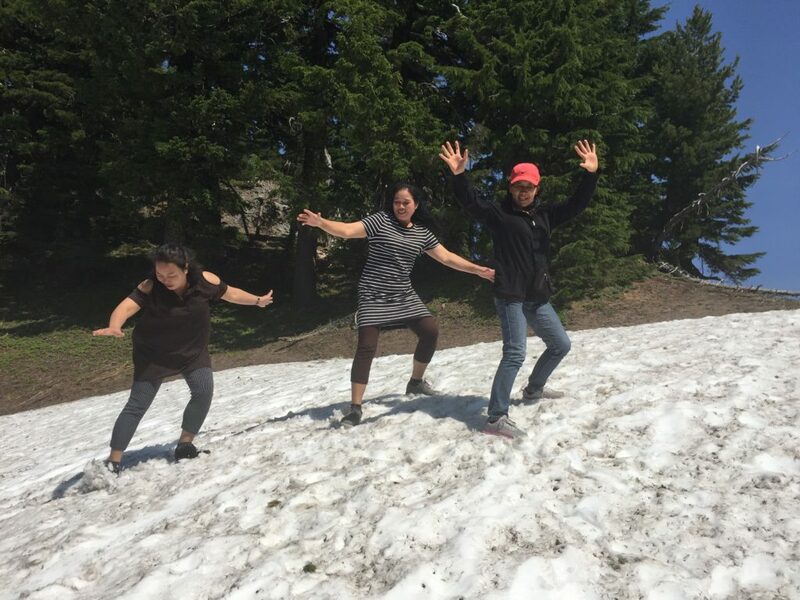 Enjoying snow for the first time at the rim of Crater Lake. Souksakone asking several times where the rice is grown. (“Why so much grass?”). Setting up a full-size Lao loom in our studio, and celebrating its completion with a quick Lao Basi ceremony and a bottle of champagne. Setting up the new loom. Finding large, juicy deer walking unabashedly around our Crest Drive neighborhood. Nobody is eating them?? Eating more meat in a week than they eat in a season – the T-bone with a baked potato was well-received. They agreed they all liked American food – as long as its fresh and home-cooked! Malaithong, Souksakne Josh and Phout enjoying the natural outdoors. Roasting the hottest of jalapenos on our bbq grill to gain a bit of “flavor” for the rice. 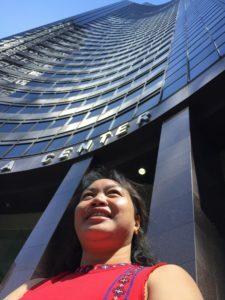 Phout at the ground level of the Columbia Center. Better place to be! We laughed so much, and we are so grateful for Malaithong’s translation efforts. On one evening late in the week, as we shared a bottle of wine, Maren mentioned how we felt like we truly had family in Lao. How was it possible for people so far apart to find such a heart-bound friendship? 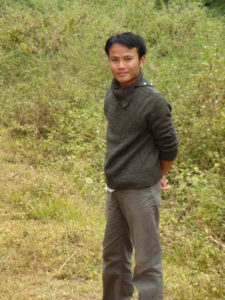 Malaithong explained that the Lao have a specific word – Seo – to refer to a friend with who you share a deeper connection. And that yes, we were all seo, bonded by our trust and affection. 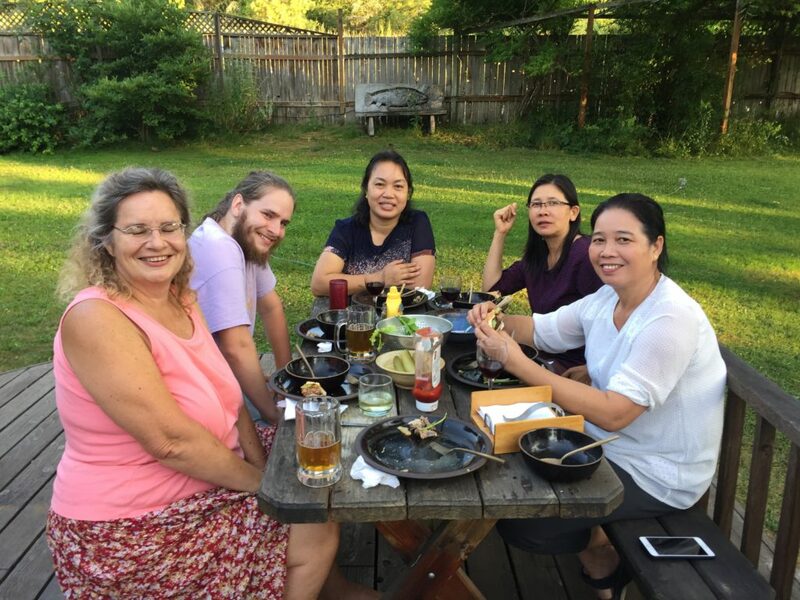 Sharing another wonderful meal – hamburgers! Joining us is our son, Ari. 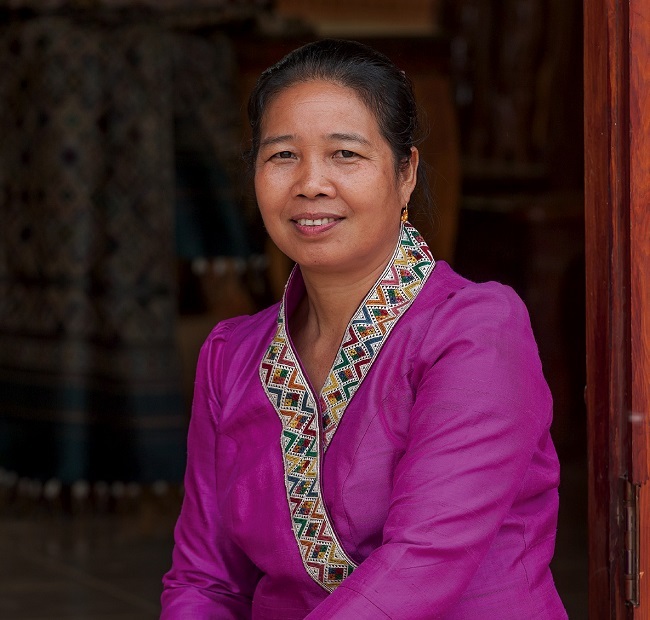 To read more stories and learn about the silk craftwork of these women (and we dedicate a chapter each to both Souk and Phout) and many others, we lure to our new publication: Silk Weavers of Hill Tribe Laos: Textiles, Tradition, and Well-Being (Thrums Book, 2017) by Joshua Hirschstein and Maren Beck, with photos by Joe Coca. You may order an autographed copy at www.hilltribeart.com, or order through Amazon or your favorite bookstore. 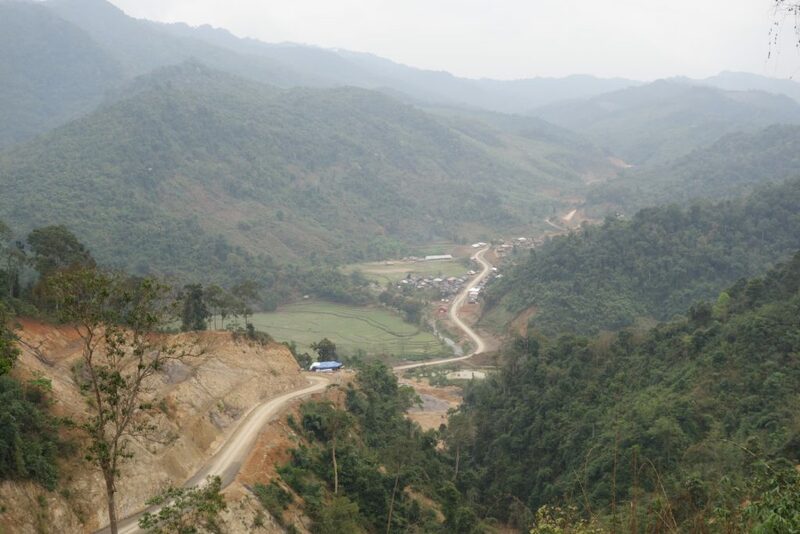 Maren and I have just returned from an amazing set of adventures in both the far NW and the remote NE of Laos. We found ourselves often in villages where the residents had never met white-skinned people (although they’d of course seen such on TV and in photos), and we were consistently impressed with the textile arts and the open welcome of the people. As we prefer, we nearly always traveled with a local translator helping us facilitate the great pleasure of sharing conversation (and meals!) with the locals. The new district capital of Meung Kuan: from a sleepy village of 60 thatched-roof homes to a modern platted city in 3 years, complete with a new hospital, secondary schools, covered marketplace, sealed and well-drained roads and several new government buildings. Efficient gas-powered rice threshing machines are available in all villages. Our largest take-away from this trip is the evidence of the incredibly rapid pace of development in even the most difficult to reach places. Graded roads, electricity, and access to education and knowledge is flowing into these remote regions at an unprecedented pace, and every year we witness vast changes in their lives. While we recognize that some things are lost in this modernization, such as traditional animist beliefs and a required devotion to subsistence farming and cloth-making, we recognize that the vast majority of those experiencing this new-found modernity are grateful and eager to participate in a more global world. More specifically, the advent of regular electricity has brought phones (wired technology is completely being bypassed, and even the most remote villages can have excellent reception and wi-fi), washing machines (saving people several hours of grueling work each week), the light bulb (extending time to weave, study and otherwise earn a living), refrigerators (changing food preparation and storage), and allowing the introduction of such luxuries as blenders, television and karaoke (ok, I could do without that one! ), electric motorcycles, fans and more. We had a long chat with Mai, an 88 year old weaver in Meung Kuan in Laos, who is ecstatic that her children, grandchildren and great-grandchildren now have access to nationalized schools and possible college, that the market is full of a variety of excellent fresh and packaged foods, that people can travel to other towns back quickly (so she can visit with her businessman son who lives in Laos’ capital), and that hospital care is accessible. And to note – she was also very grateful that all 11 of her granddaughters know how to weave on a traditional loom and thus could earn a respectable middle-class income using their culture’s traditional skills (sand selling their textiles in an urban marketplace. Such conversations give me greater optimism about the future. Motorcycles are the preferred method of transportation for anyone within reach of a road. 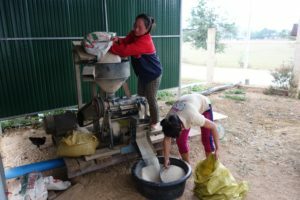 As developing nations such as Laos, Vietnam and rural China gain access to information and, their voices can be better heard and basic needs met. We cannot help but notice that the vast majority of the diverse peoples we meet are kind and generous, and they are eager to connect not just with the tools of modernity, but with the hearts of the people of the world. The family unit is still strong, and mutual respect and cooperation is treasured. While we can find myself sometimes caught up in the arguments of politics, such ventures reminds us that what is most vital for our daily lives is found in our personal relationships, the respect we share with and for others, and the gratefulness we should treasure for having food on the table, the comfort of a warm home, and the affection of family and friends. This weaver, before meeting us, had never seen white people outside of television and other media. While still very remote, the region is modernizing at rapid pace. 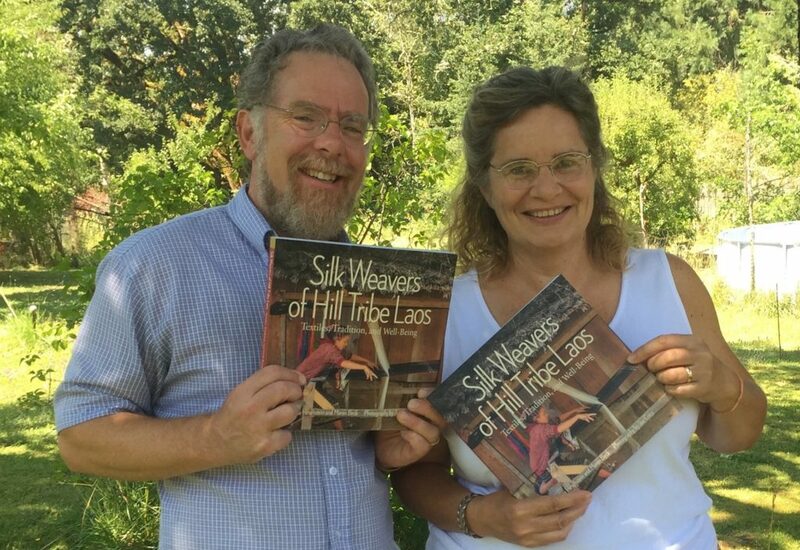 Our schedule is now set for the 2017 year (visit www.hilltribeart.com/events), and soon we will be crowing more loudly about our upcoming book (available this Fall) published through Thrums Books: Silk Weavers of Hilltribe Laos. 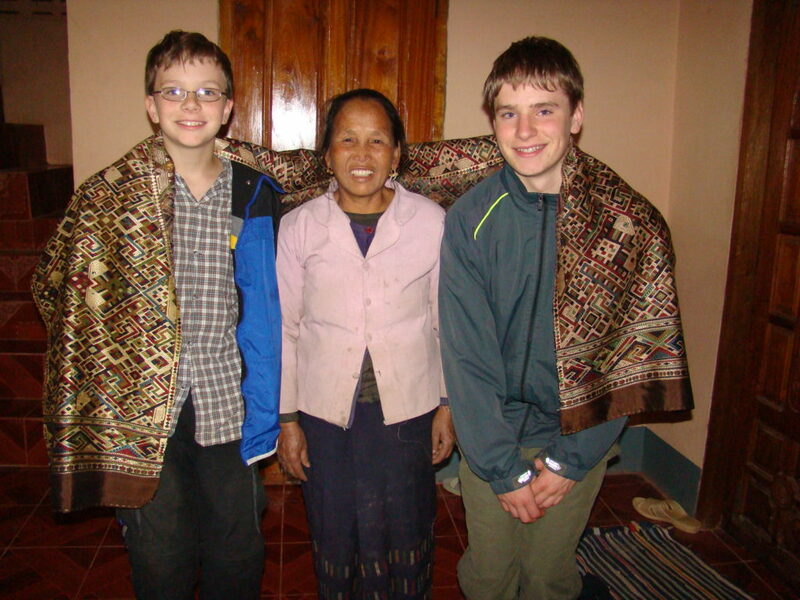 Maren and Josh share some time with a 72 yea0-old Akha elder in the far NW Laos. The red of her lips is from chewing betel, a jungle nut. 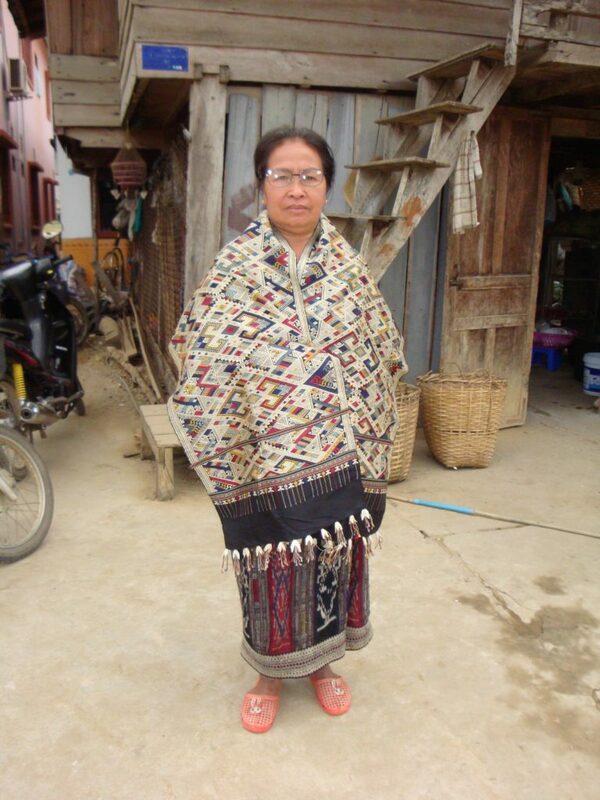 Her clothing is made of locally-raised, handspan, hand-woven cotton. Her head-dress is of silver. Our ethic for our 10 years as Above the Fray has always been to minimize our impact as to what the weavers of the region choose as design, preferring that they reach into their creative talent and traditions as opposed to chase what they may think will sell well in a western-style market that they have not met. This last year we broke that rule, and we’re glad we did! 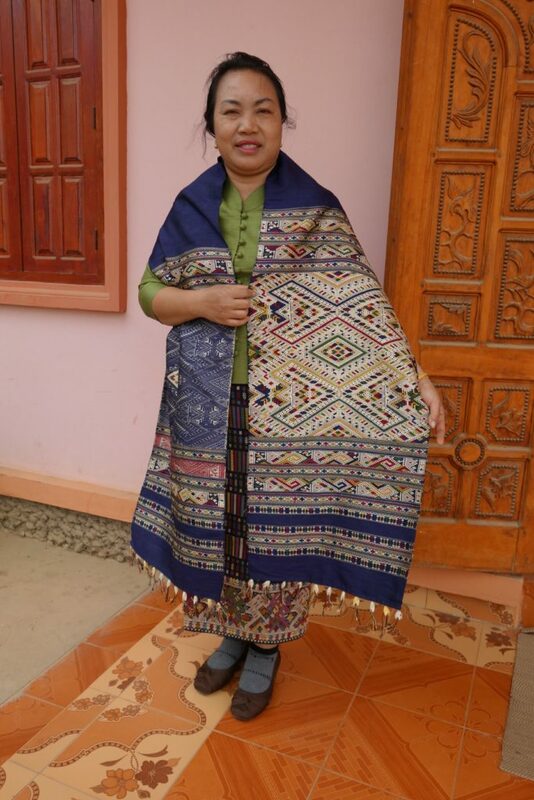 Phout, a master-weaver and dyer who lives in Houaphon Province, Laos, had woven several gorgeous all-silk “man-woman” healing cloths some years ago. 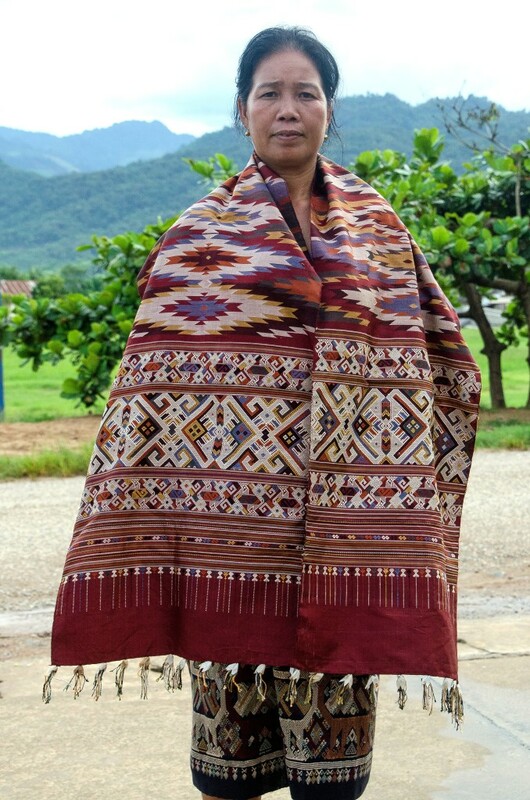 We have found this traditional style of shaman’s shawl (in Lao, phaa sabai) to be uniquely attractive. The “man-woman” phaa sabai is a complex silk of three contiguous panels: the two end panels are woven in the discontinuous supplemental weft style with the center panel left in plain-weave with no supplemental decoration. The two end panels are of identical design, yet one side has received a full spectrum of supplemental colors to highlight the motif-patterns, while the other side is left in only two muted colors that seem to hide the design. The weavers smile when they tell us that the vibrant, complex side represents the spirit of the female, while the “simple” side represents the spirit of the male. Phout models one of the 100% silk man-woman phaa sabai we had ordered. 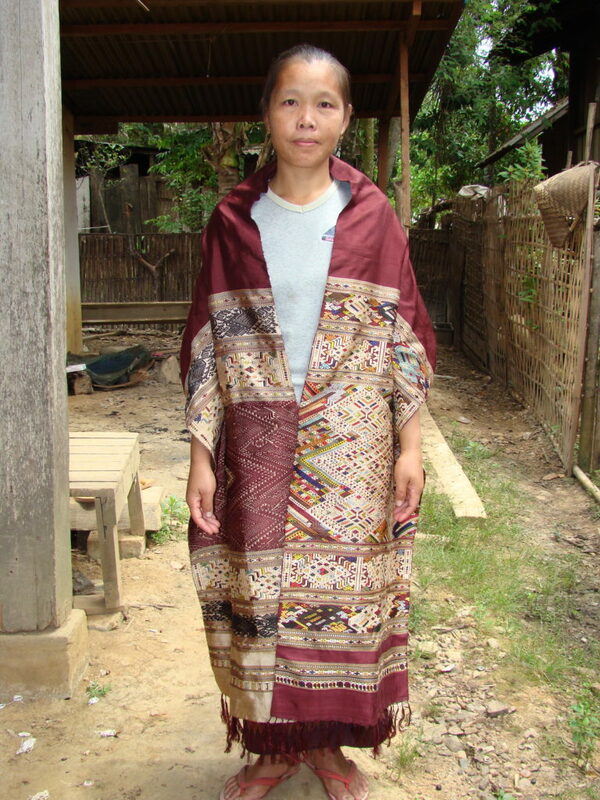 The silk is locally-raised, and Phout did the natural-dye work herself. A local healer would traditionally use such a cloth as a tool to gain access to the “spirit world” to perform a healing, whether the injury were physical, mental or spiritual. The “man-woman” expression is symbolic of the need for humans to have spiritual balance within themselves; a lack of well-being would be a confirmation that one’s “life-force” is in need of repair. Phout had indicated that this complex design was not finding a niche in the marketplace, and that a weaver’s time was better spent on other designs that the tourist markets were finding more profitable (phaa sabai cloths require a lot of hand-reeled silk and time on the loom). Another “man-woman” healing cloth from the same region; the weaver is the model. “But they are so beautiful, and traditional,” blurted out Maren. Phout rolled her eyes. But the truth is obvious: if it doesn’t sell, then it cannot take up the valuable time of the weaving experts. So we ended up “ordering” that she ask one of her finest weavers to weave an older man-woman healing cloth design Phout has in her archives, in three different ground colors. They are stunning! Even Phout was excited about how they came out. Yes, we paid a bit of a premium for the “special order,” but we believe they will sell well in the emerging international market, and perhaps create some momentum for this style of traditional cloth to remain relevant in the styles of cloth that the master-weavers perceive the market will support. Phout is a wonderful energy and loves to laugh, and she and Maren have a sister-like affection for each other. Every time we get together we soak in each other’s company and, thanks to our translator Mai (who is a childhood friend of Phout’s), we can share thoughts and stories. Another 100% natural-dyed silk “man-woman” healing cloth modeled by the weaver. Phout focused. She started with a buzzing “dzzzz” and then puckered to an English “j.” She held the sound and rolled her eyes towards me for confirmation. 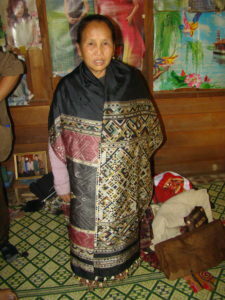 Phout’s aunt, Sukkhavit, dons a shaman’s traditional healing cloth; this one is not of the “man-woman” style, but is equally stunning. Phout jumped off her “dz,” shot across a long “ahhhh” and landed back on the “dz” sound again. “Dz-aah- dzzzz.” she enunciated in a fizzle. “Dj-dj-aaaah-zhhhhhh,” she echoed again, nearly begging for approval. Bounkeo threw out his version again, and Phout again repeated it. 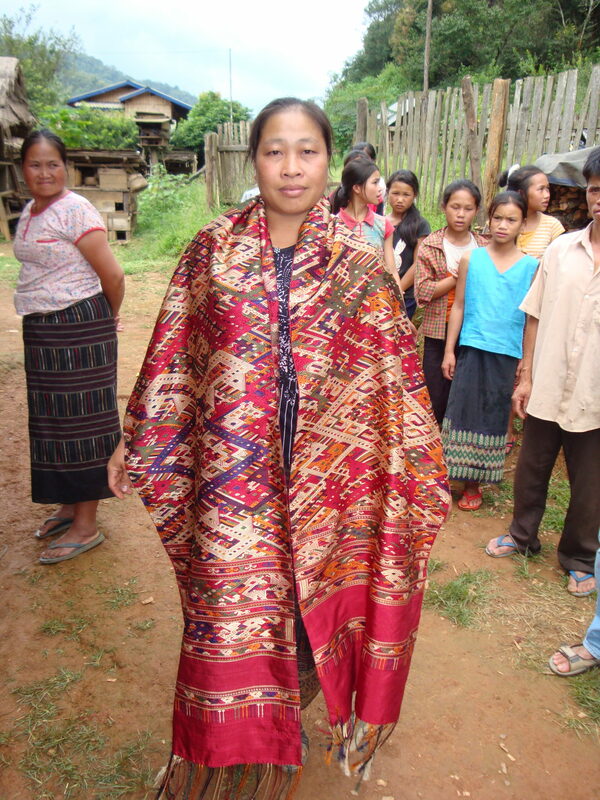 Here Phout dons another style of a “shaman’s shawl.” Her design and dye work is some of the finest in the world. She has 50 weavers who work under her direction.